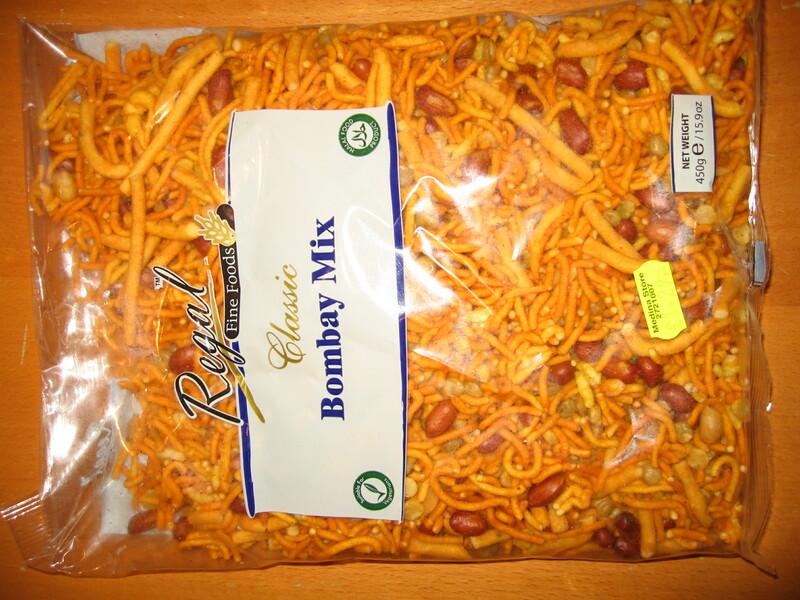 Bombay Mix is an snack, originally derived from the Indian subcontinent, made of (usually) gram flour noodles, lentils, and peanuts. 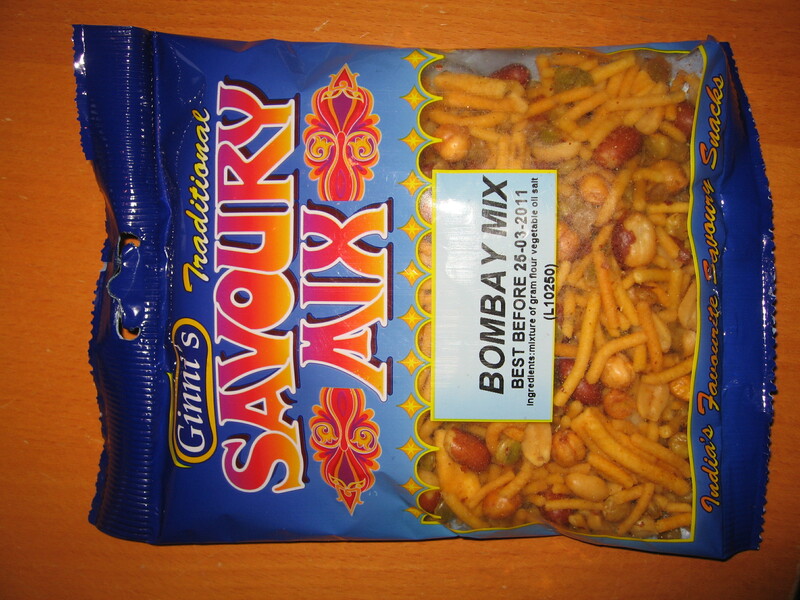 It comes from a family of snacks that differ in their ingredients but the key thing is that bombay mix never has currants in it (unlike the unpleasant KCB Chin Chin Mix). I like it, a lot, but there are many different makes these days, under a variety of names, so how do you know which are good? 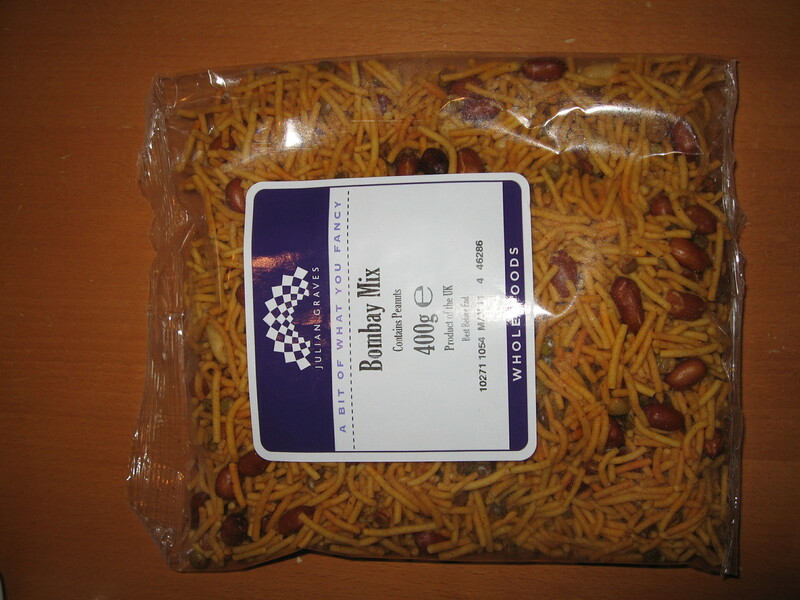 That is what I hope to tell you… so onto the Bombay Mix, in order of eating – reviewed by myself and occasionally also my middle son. At some point I should list these in preference order I suppose but that would spoil your fun reading through the list. 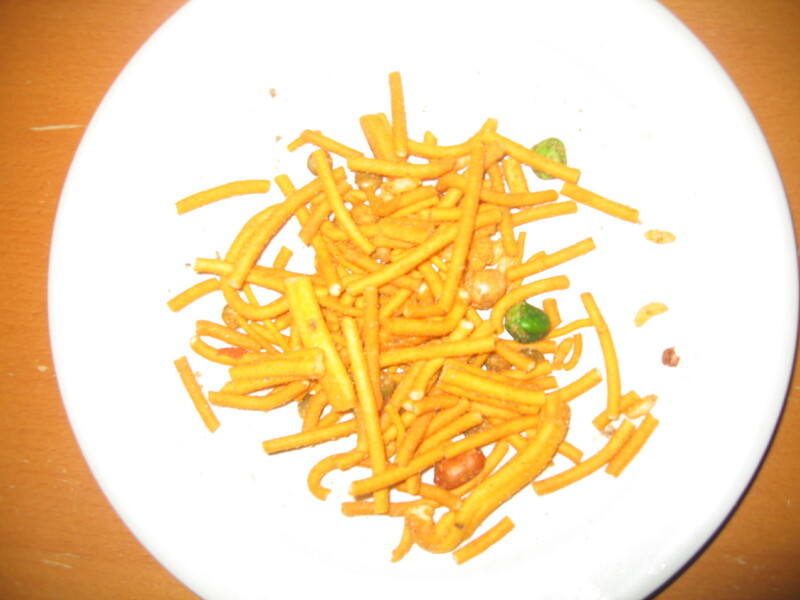 Look: Larger noodles, contains red-skin peanuts, obviously green peas and chick peas. Opinion: Really quite spicy. 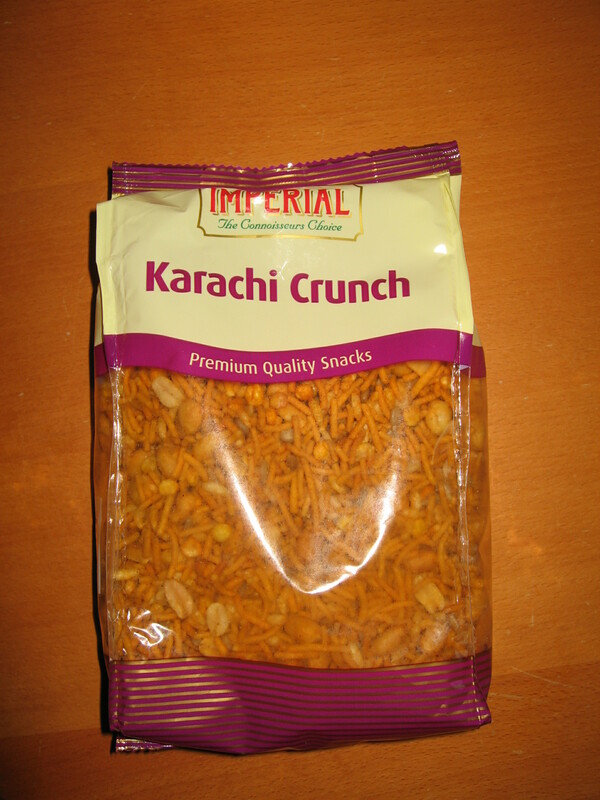 Good crunch. Opinion: Somewhat bland and lacking in heat. 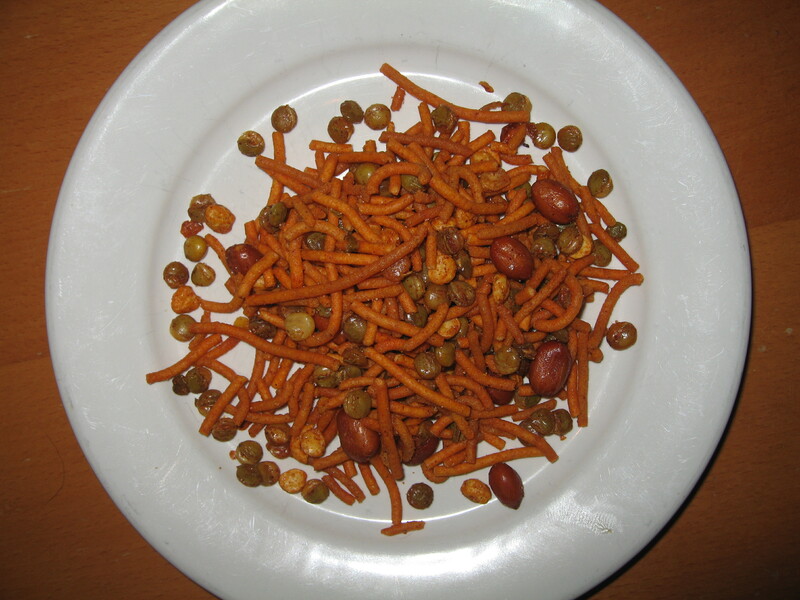 Good crunch and not unpleasant if you really don’t want to surprise or harm your guests! 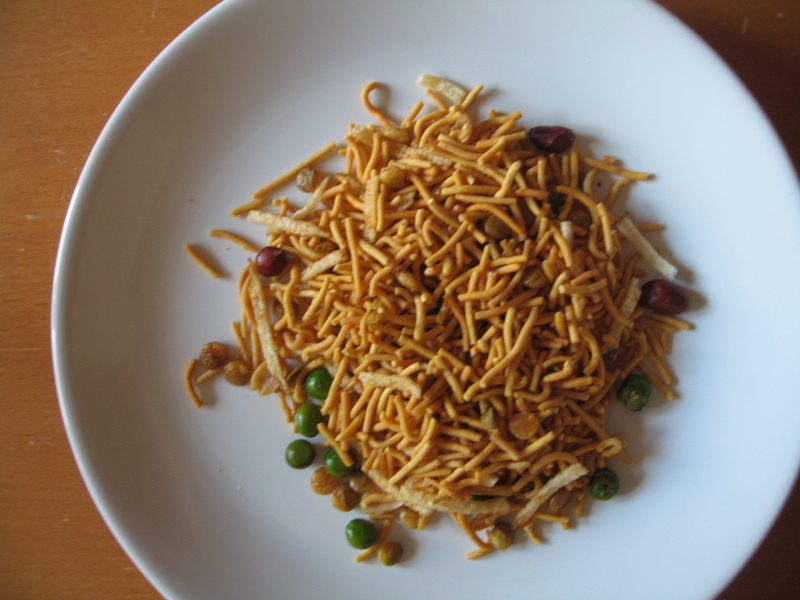 Look: Traditional sized noodles, with split lentils and red-skin peanuts. Opinion: Mild flavour with clear cinnamon taste and smell. Refreshing change from normal style but can be a bit overpowering after 4/5 mouthfuls. 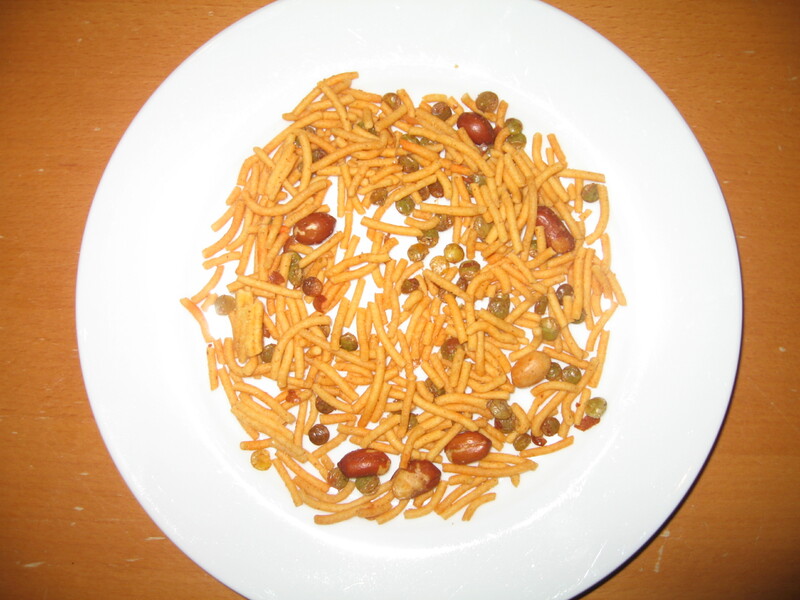 Look: Traditional sized noodles, with split lentils, red-skin peanuts and chick peas. Opinion: Pleasant enough but not very spicy. Tend to end up with a dry mouth quite quickly. Opinion: The extra green peas (that are red…) make this really quite hard work on the jaw and makes it even more mouth drying than the London Mix. 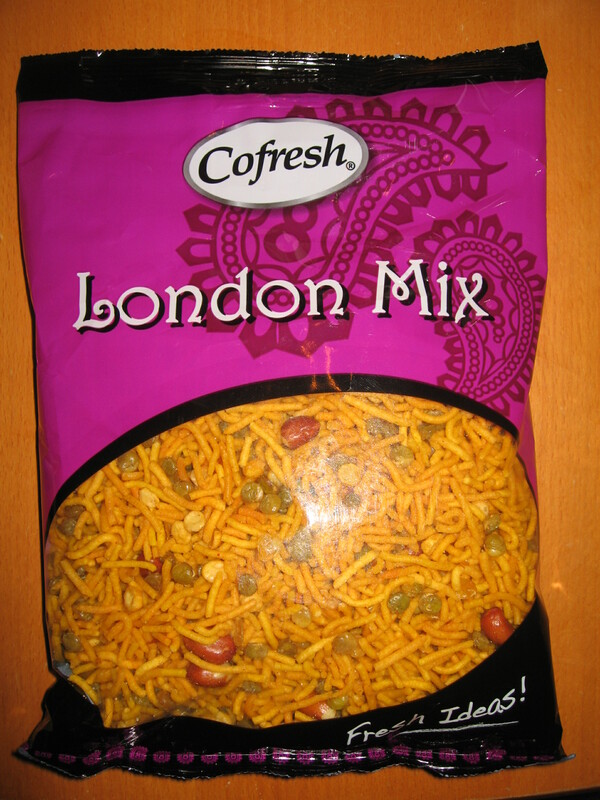 Again like London Mix it is not very spicy. 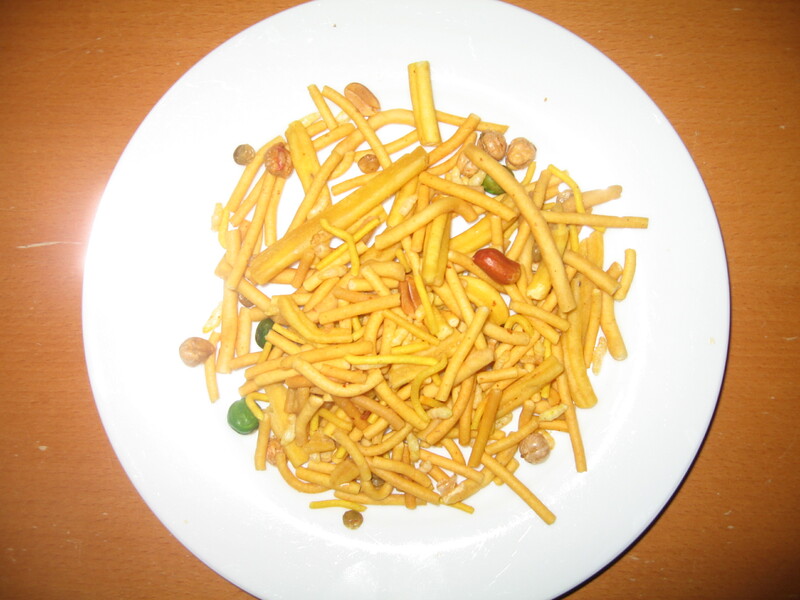 Look: Traditional sized noodles, with two kinds of split lentils and red-skin peanuts. 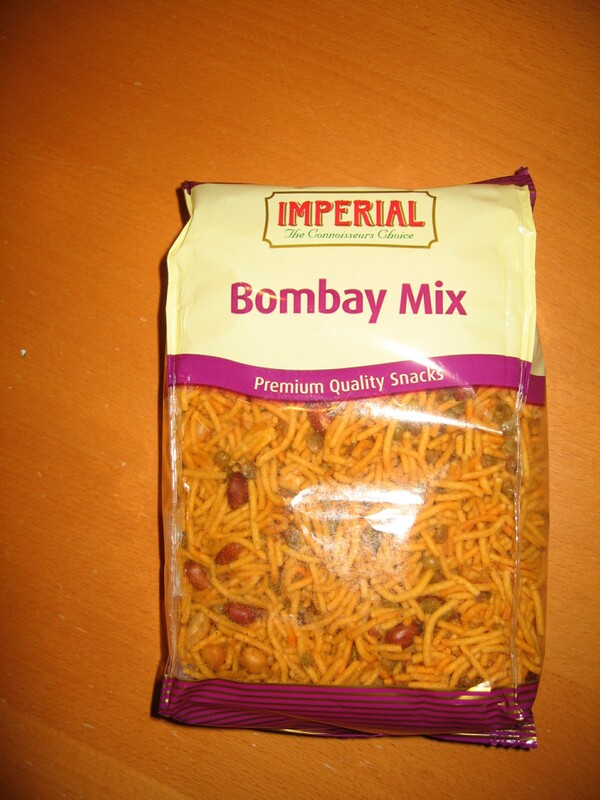 Opinion: The King of Bombay Mix. 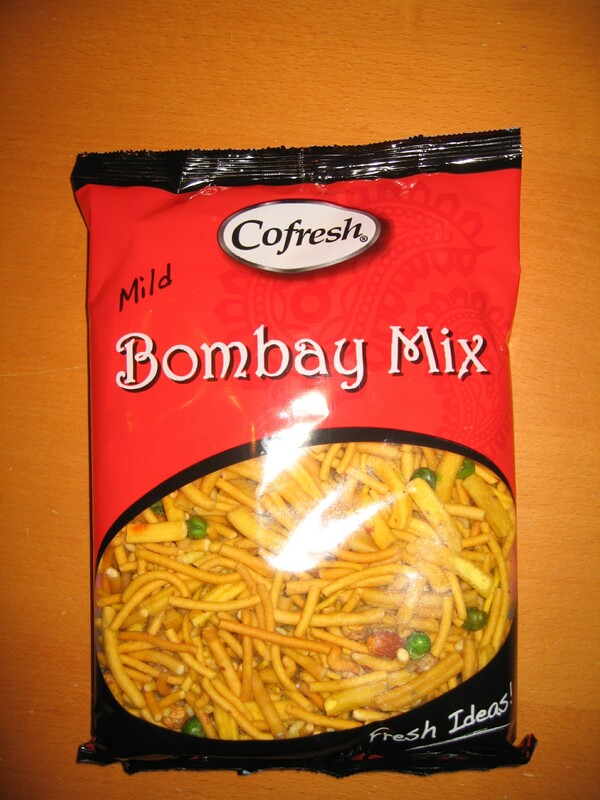 The right amount of crunch and the right amount of spice. 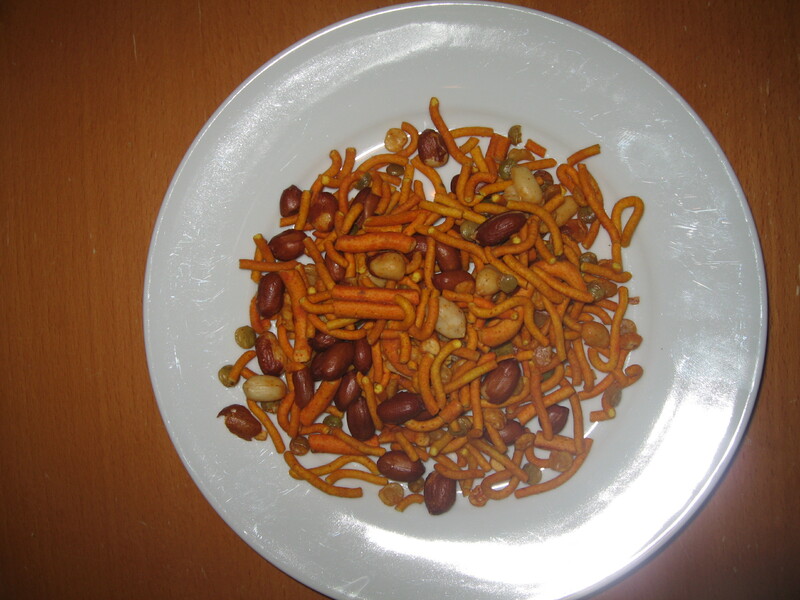 Opinion: The large noodles tend to dry the mouth out and dull the taste, but the peanuts are very good and overall there is about the right level of heat. 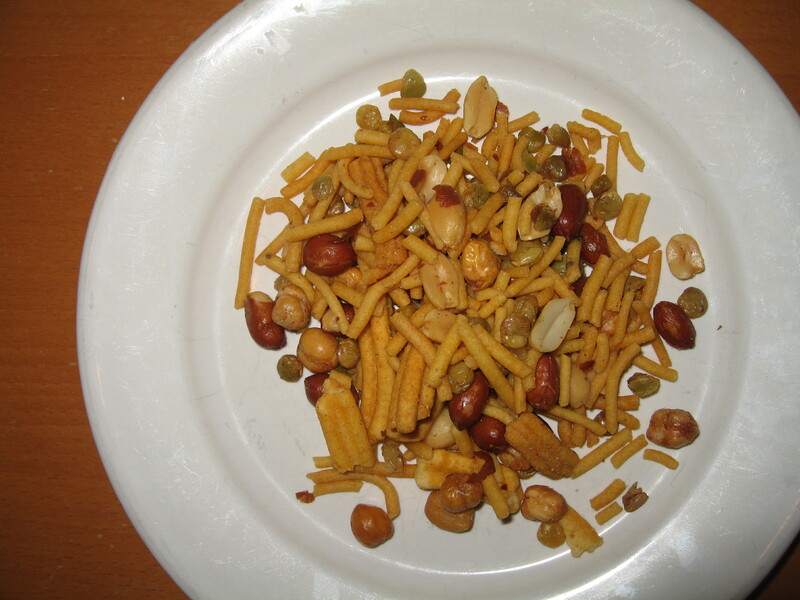 Look: Traditional sized noodles, split lentils and peanuts, with sunflower seeds and puffed rice. 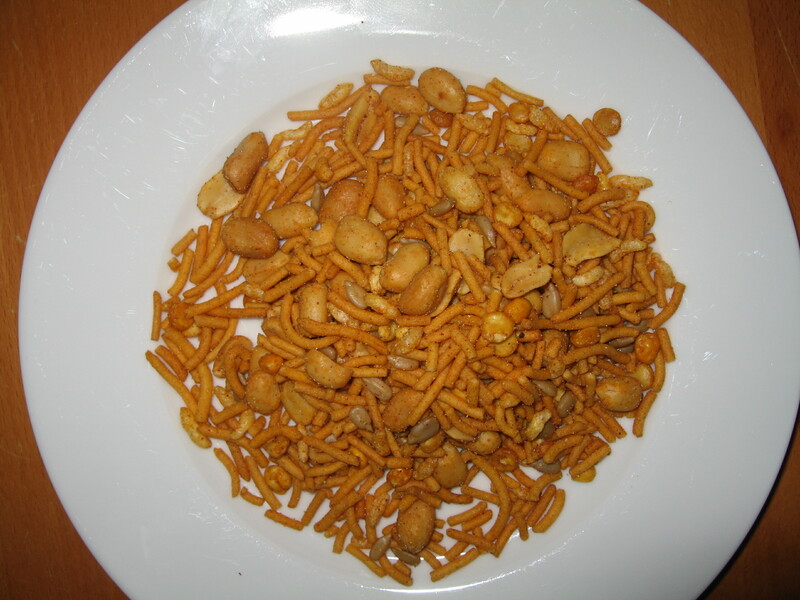 Opinion: The dry roasted peanuts and sunflower seeds nicely dominate the taste of this pleasantly spiced snack. 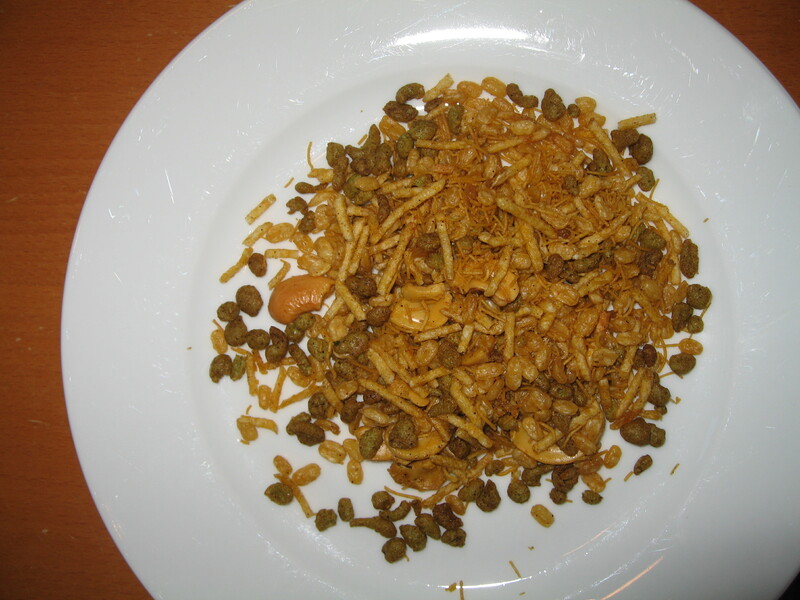 You don’t really notice the puffed rice and the lentils are barely present in the taste. A nice change from the usual mix. 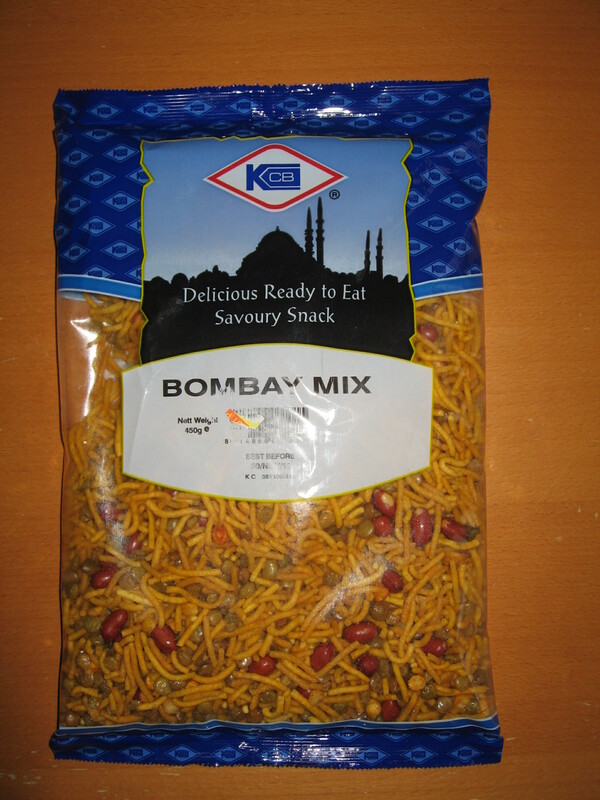 Opinion: Almost as good as KCB Bombay Mix though slightly less peanuts and a shade less spice mean it can’t quite muster as many points. 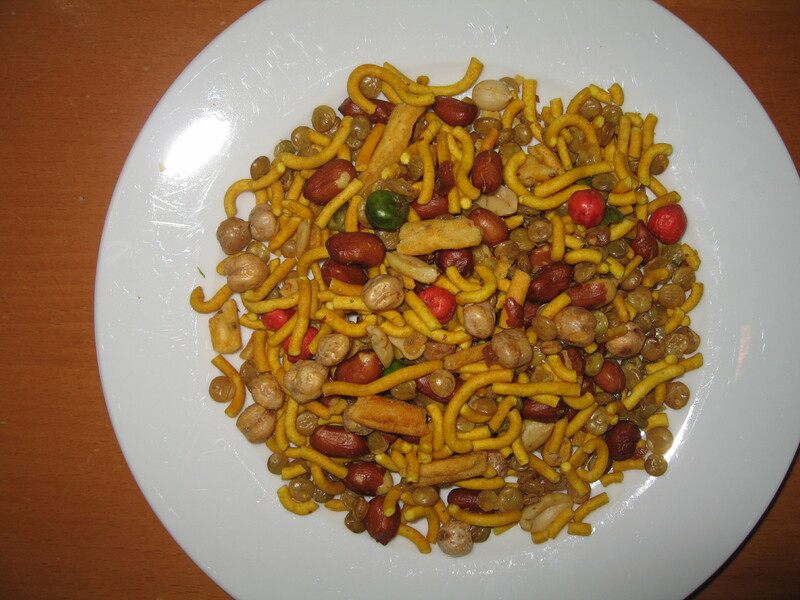 Look: Traditional and larger sized noodles, split lentils, red-skin peanuts, cashew nuts, and chickpeas. 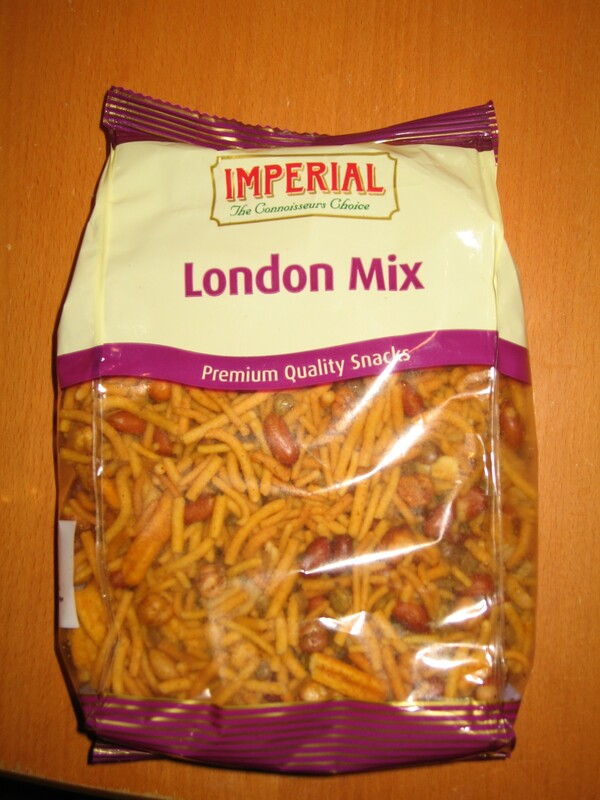 Opinion: Disappointingly floury version of Imperial London Mix with added cashew nuts. Far too much noodle floor. 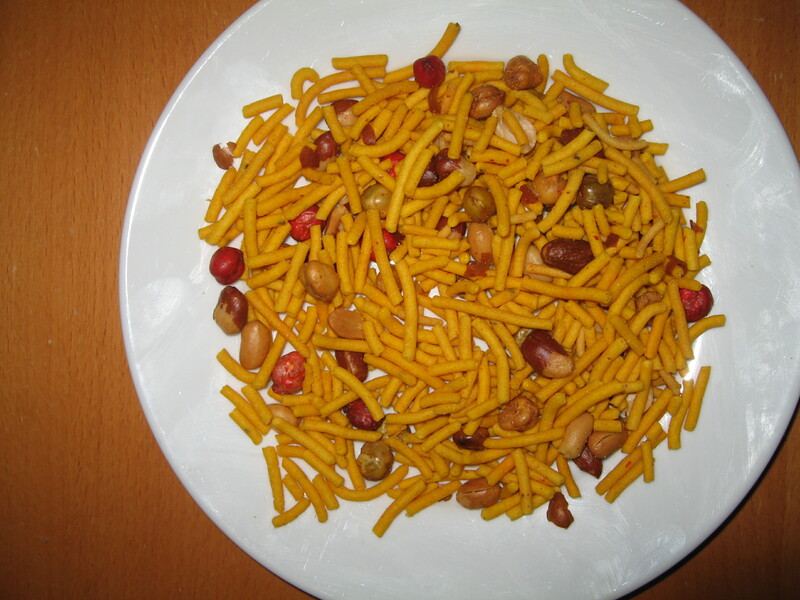 Look: Traditional and larger sized noodles, split lentils, red-skin peanuts, and chickpeas. Opinion: Looks better than it tastes. Lacking in heat and surprising dull taste. 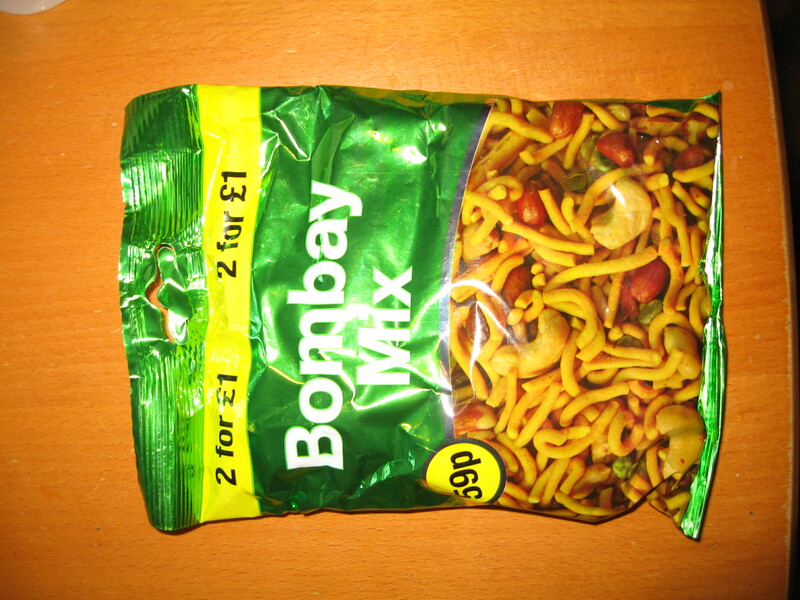 Not at all cheaper than buying the ‘asian’ packaged foods from the ‘World Foods’ section of the supermarket. 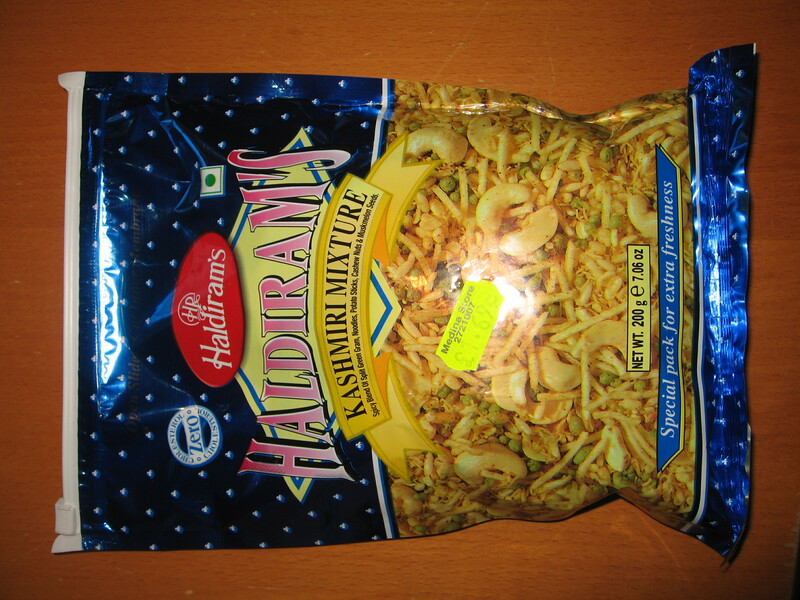 This was in the crisps and snacks aisle so perhaps it is quantity that is meant to be the attraction. 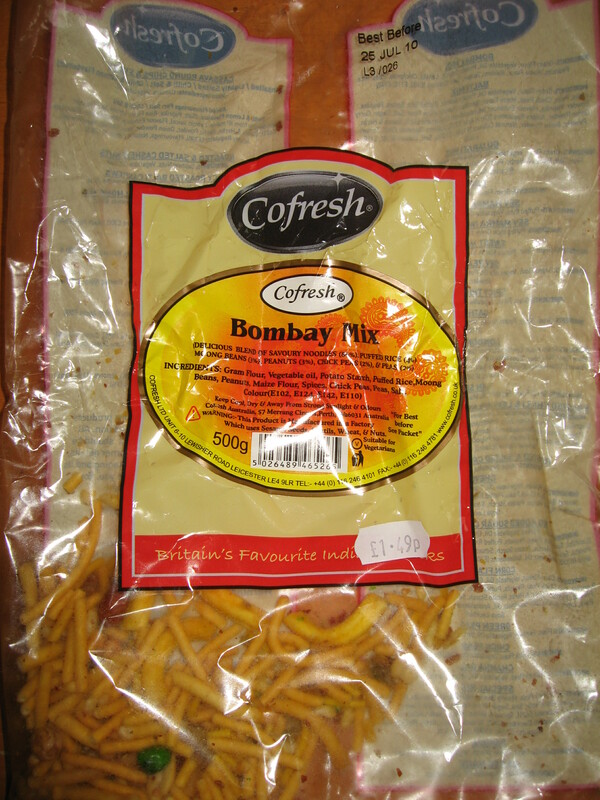 Look: Traditional sized noodles, oddly shaped gram flour spindles, curry leaves, ground nuts , large potato fritters. 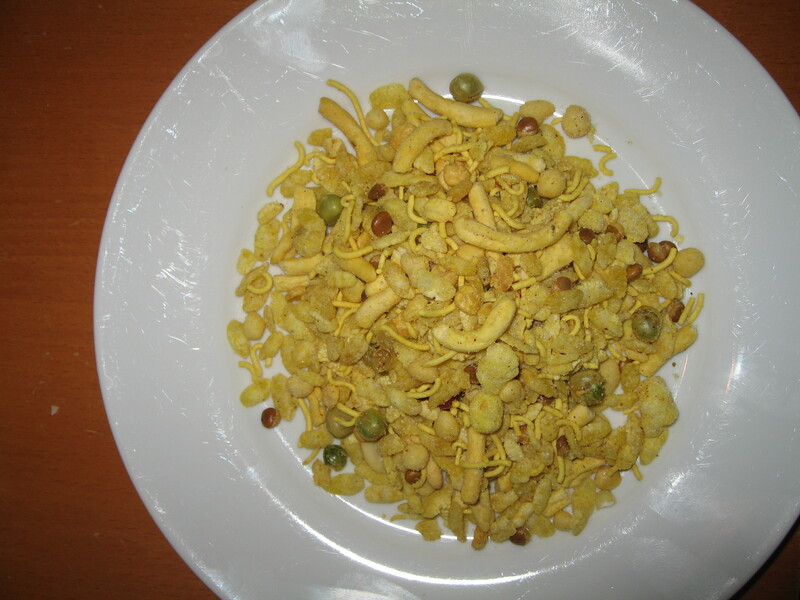 Look: Traditional sized noodles, split green and yellow lentils, red-skin peanuts. Opinion: Although it looked a bit bland, this was actually quite tasty with a reasonable afterburn in the mouth. 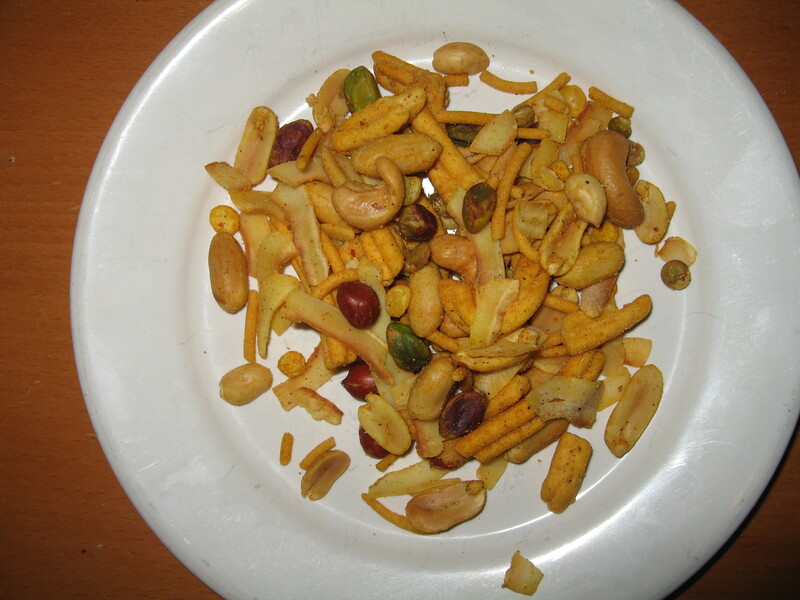 It was a bit short on peanuts as far as I was concerned. 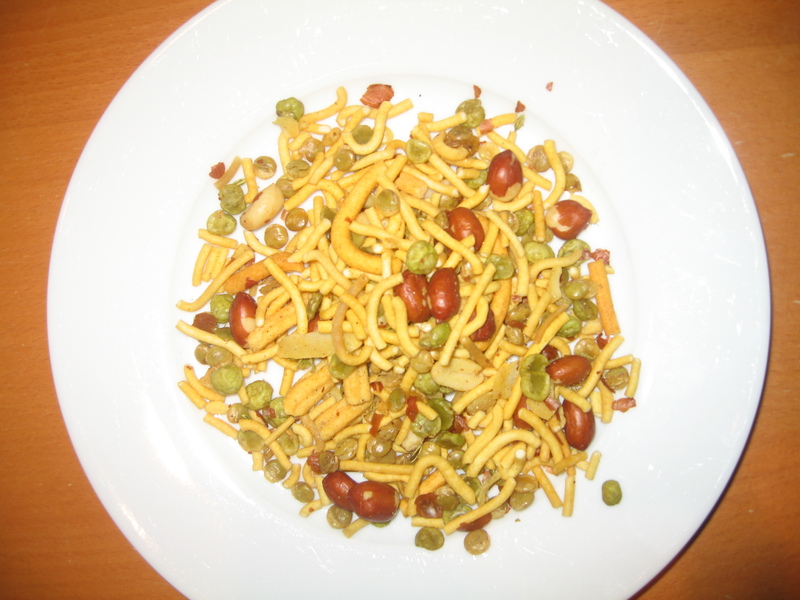 Look: Traditional sized noodles with peanuts, peas, and an abundance of yellow split lentils. 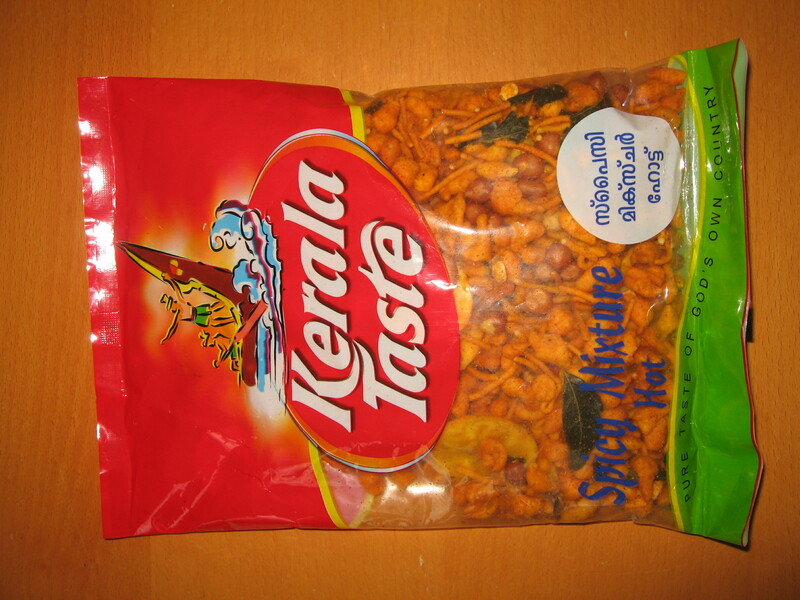 Opinion: Slightly hot on the back of the throat with a distinctive and not altogether pleasant aftertaste, on the barbecued side, perhaps because of overheated asafoetida/mango powder? 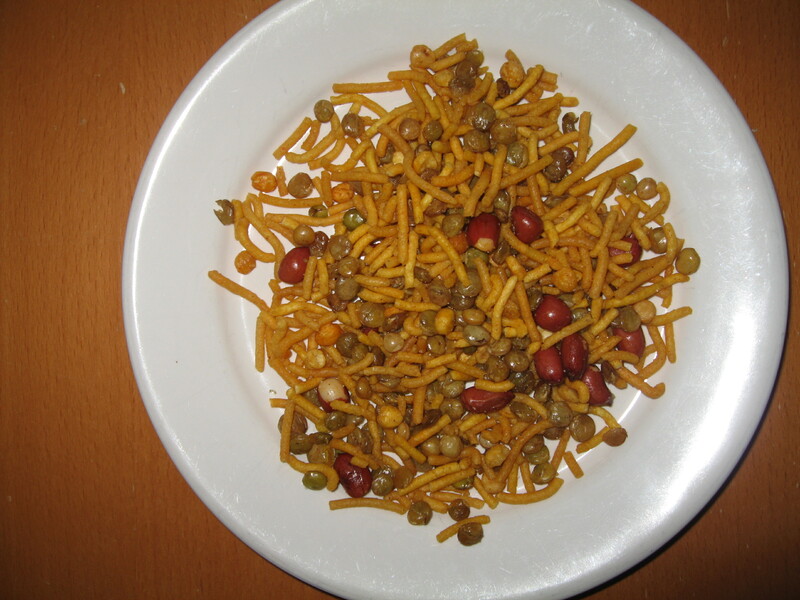 Look:Traditional and larger sized noodles with peanuts, peas, plain and coloured chickpeas, split lentils, puffed rice. 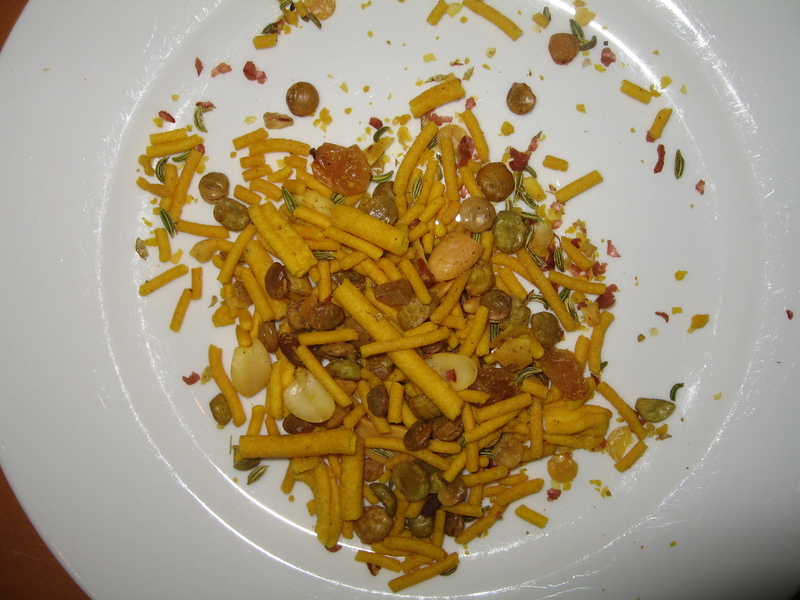 Opinion:A colourful and quite tasty mix, though tending towards drying the mouth, again because of those larger noodles. 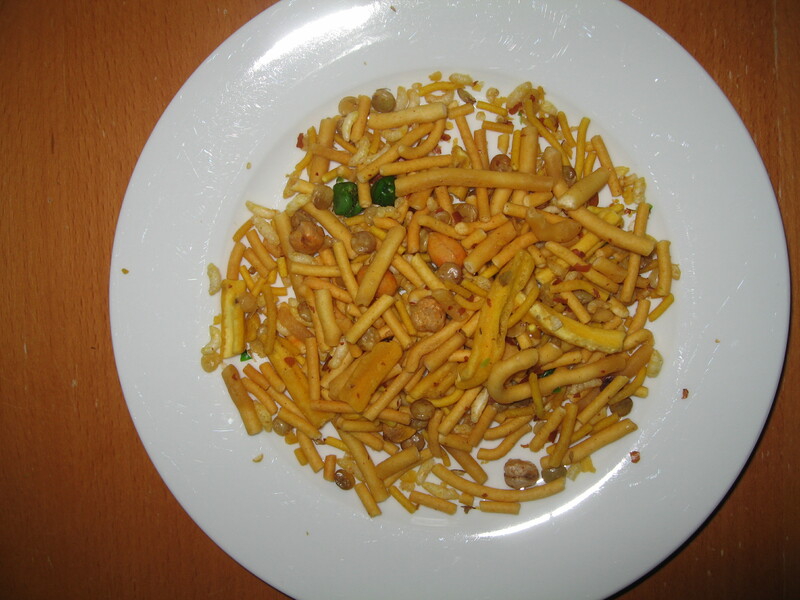 Look:Traditional and larger sized noodles with lots of peanuts, peas, plain and coloured chickpeas, split lentils. Opinion:Reasonable taste, though very mild. Nice peanuts. Perhaps tending towards staleness. 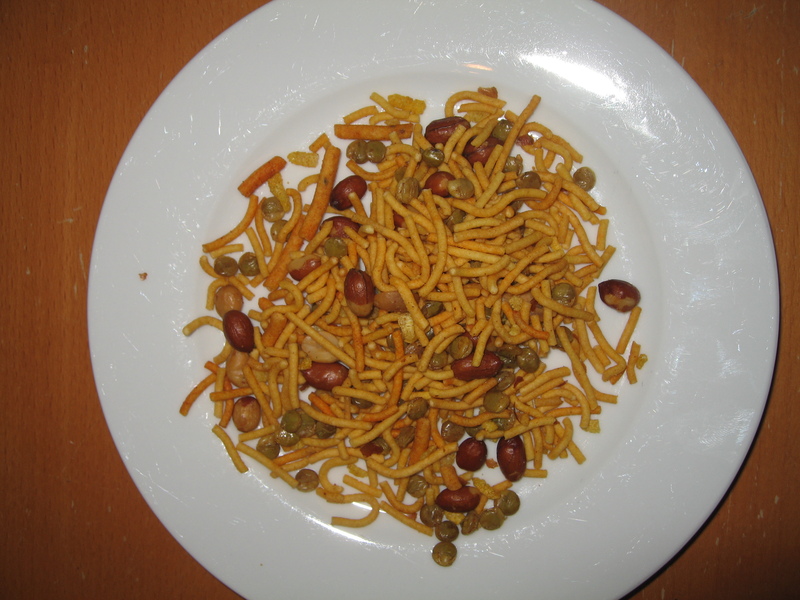 Look:Larger sized noodles with peanuts, green split peas, chickpeas, and lentils. Opinion: Dull/bland, with a hint of heat at the edges. Opinion: An excellent taste and look. They have kept it simple and that has paid off. 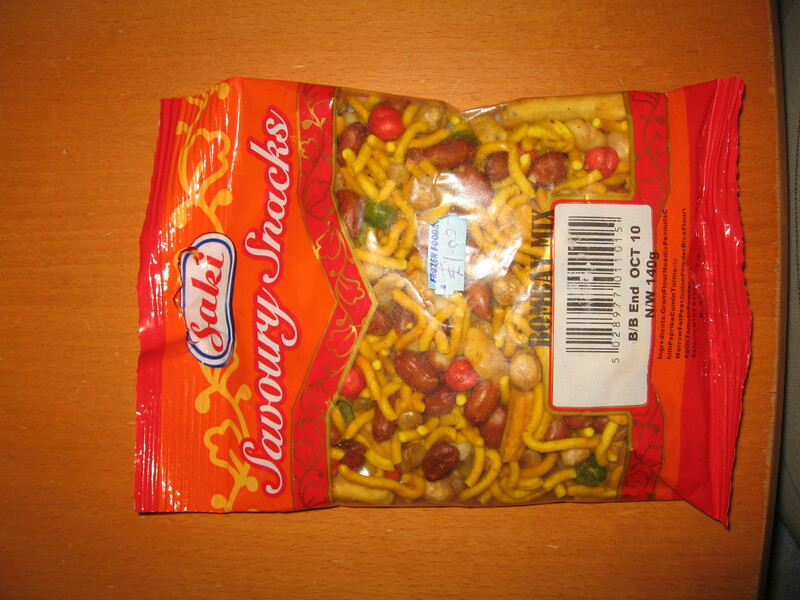 Look:Traditional sized noodles, well coloured, peanuts, lentils, chick peas, raisins – though I could find no trace of them in the bag, thankfully. Opinion: Moderate heat and moderate taste. Attractive colour. 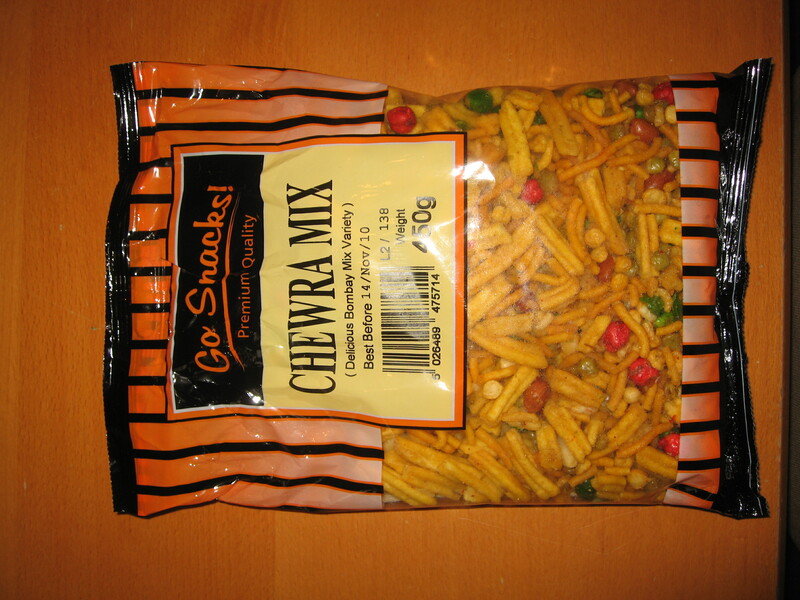 A middle of the road snack and a good introduction to Bombay Mix. 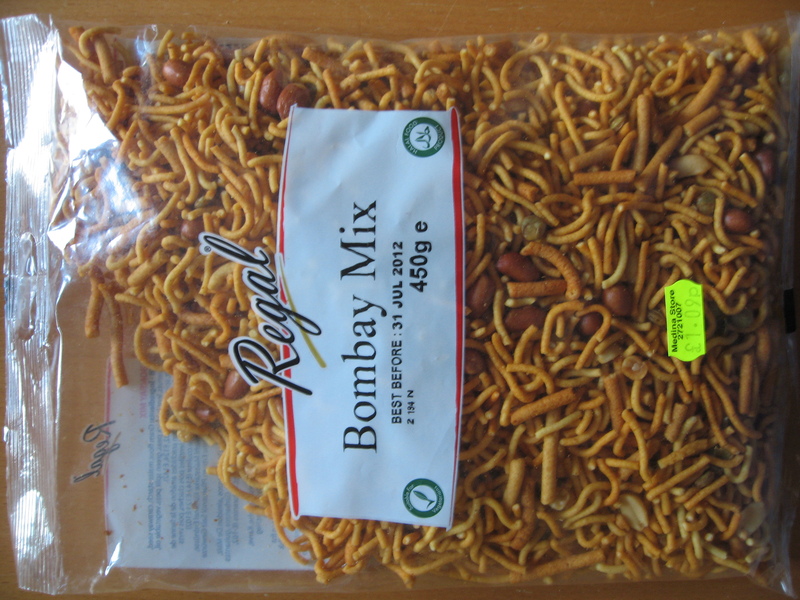 Opinion: An upmarket presentation of Bombay Mix but rather dull in the heat department, and over complicated in my opinion. 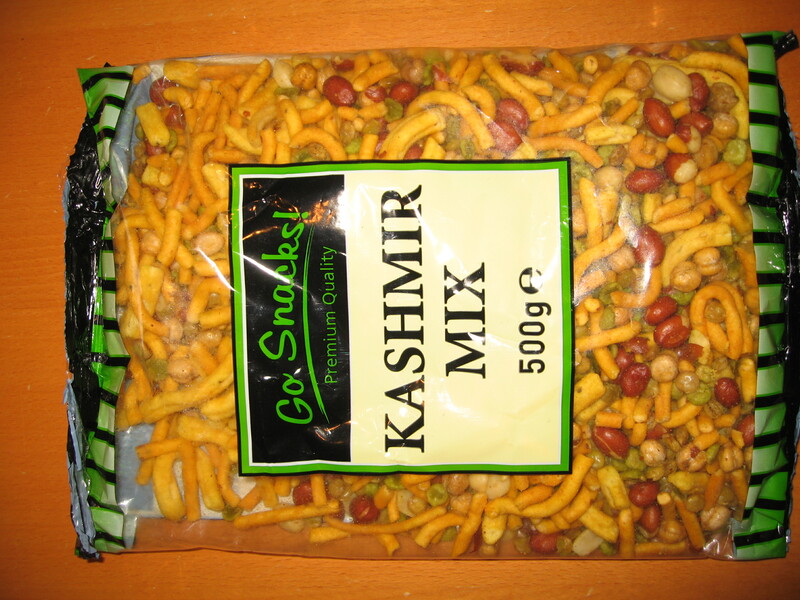 The coconut and pistachio nut combination adds a sweetness that is rather like having sultanas. Good if you want to make a good impression to the upper classes but won’t win you any favours with an asian audience. 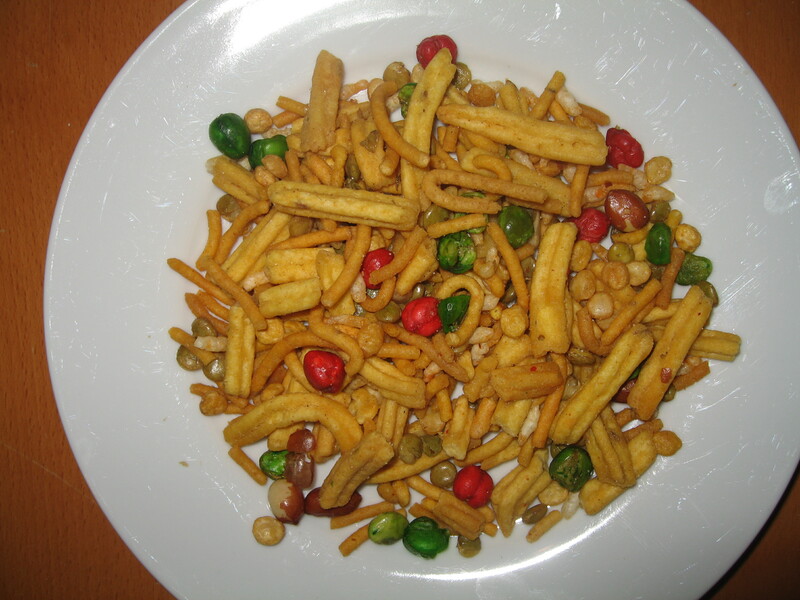 Look: Very pale on the plate, traditional and thin noodles, puffed rice, green peas and peanuts. Opinion: The pack proudly says ‘zero cholesterol’ but it is instead sickly sweet with 7% sugar content. 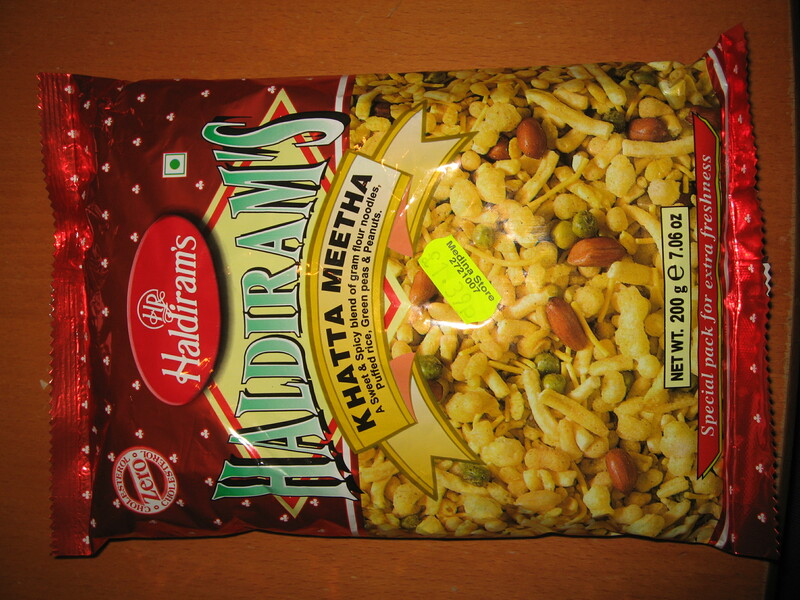 Far too sweet for mass consumption, and not enough peanuts. 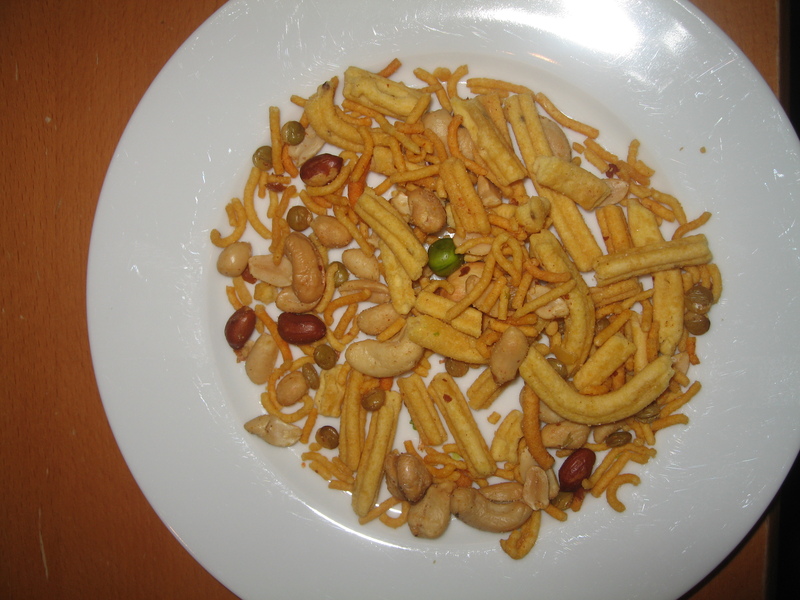 Look: Darker traditional sized noodles, peanuts, mixed lentils. Opinion: Oh Lordy. 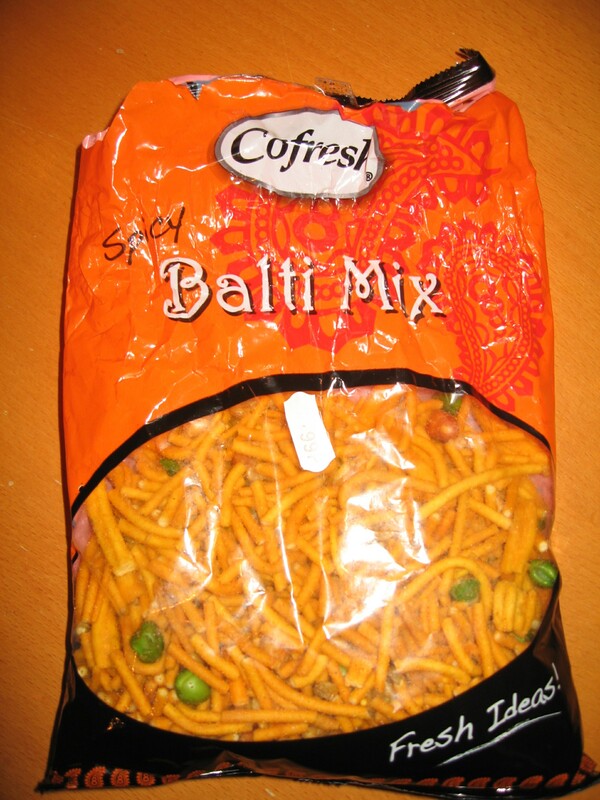 A beautifully spicy, tasty mixture evocative of my 1970’s upbringing. Hot on the back of the throat without being acrid. Just what I expected from KCB. 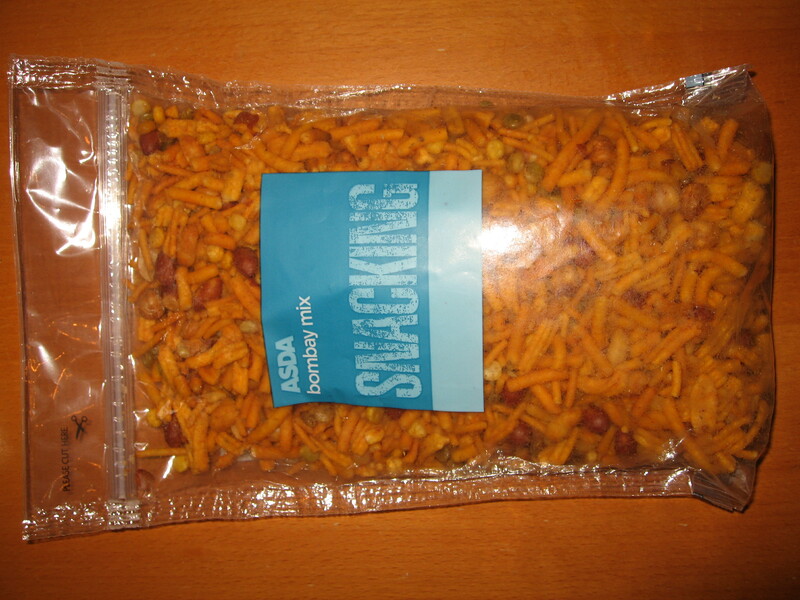 Opinion: Another Zero Cholesterol bag with a (rather ineffective) ziplock which is good for keeping the contents fresh. 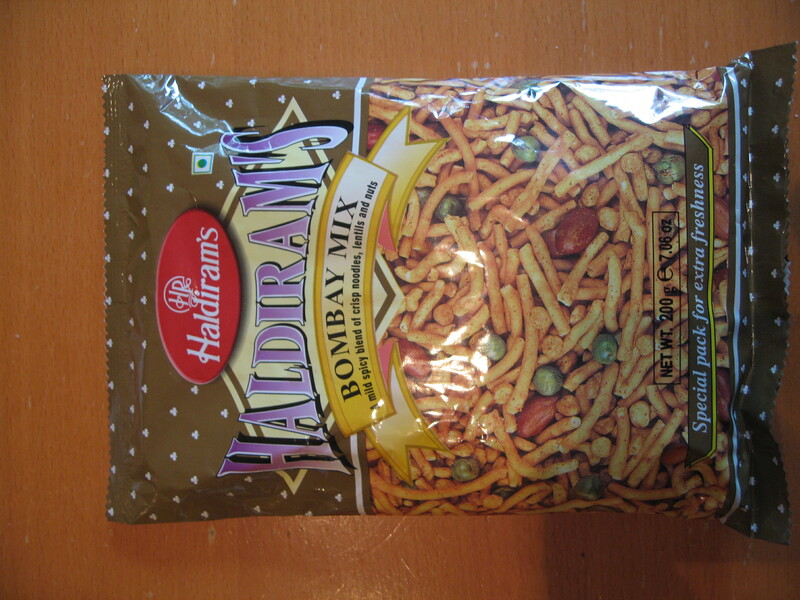 Definite zing of heat and strong taste of cumin and mace. 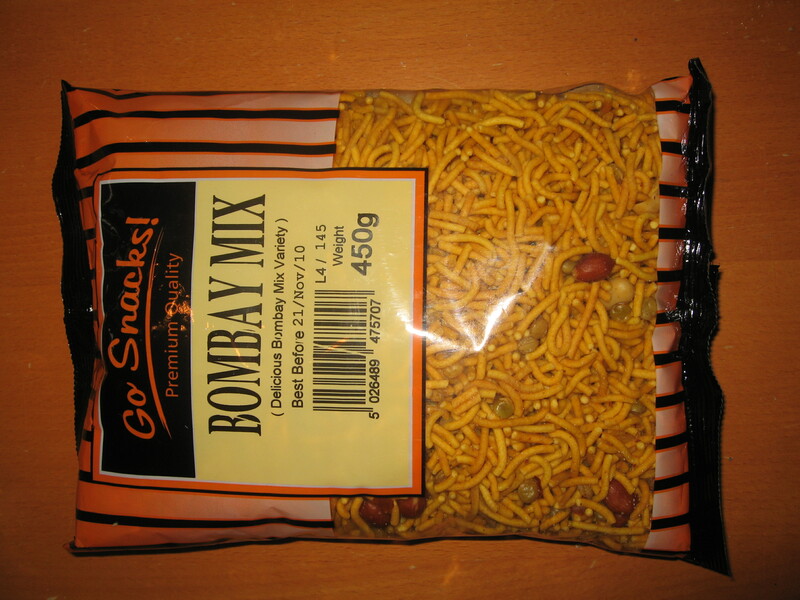 Unusual texture is interesting and this does make a nice change from traditional Bombay Mix. Recommended as something worth trying. 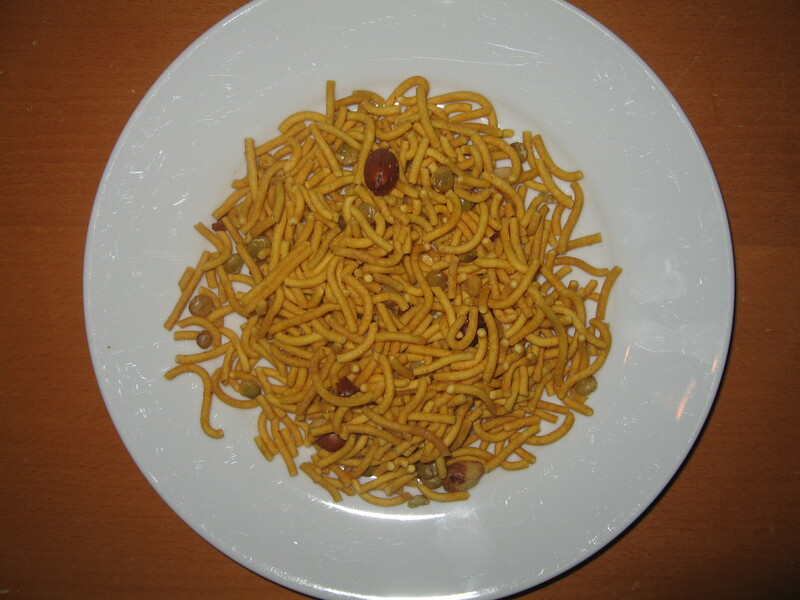 Look: Traditional sized noodles, sometimes aggregated. 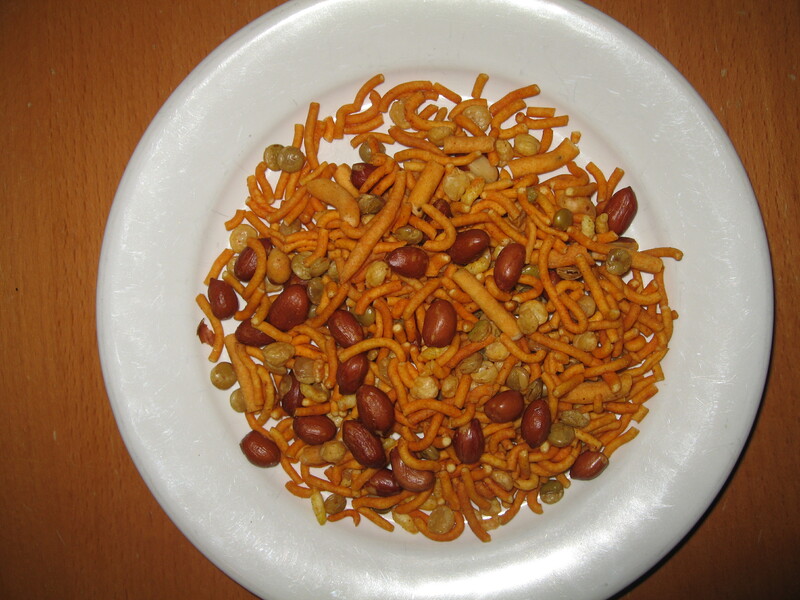 Peanuts, lentils. 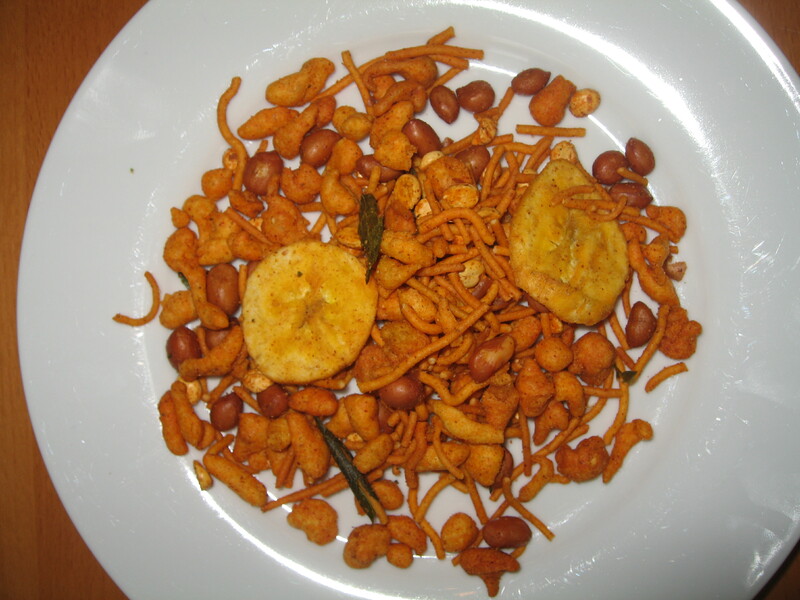 Opinion: Nothing special in terms of presentation or taste. 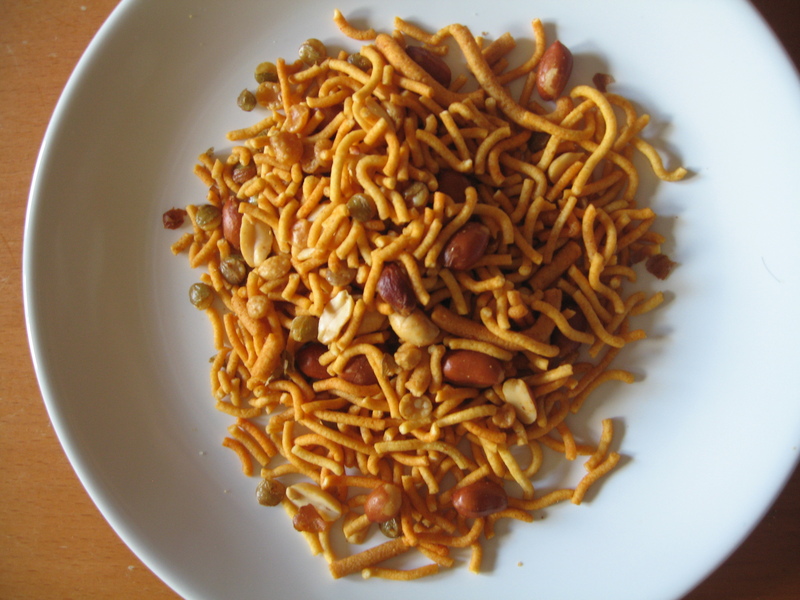 Look: Small noodles, plenty of lentils, peanuts. 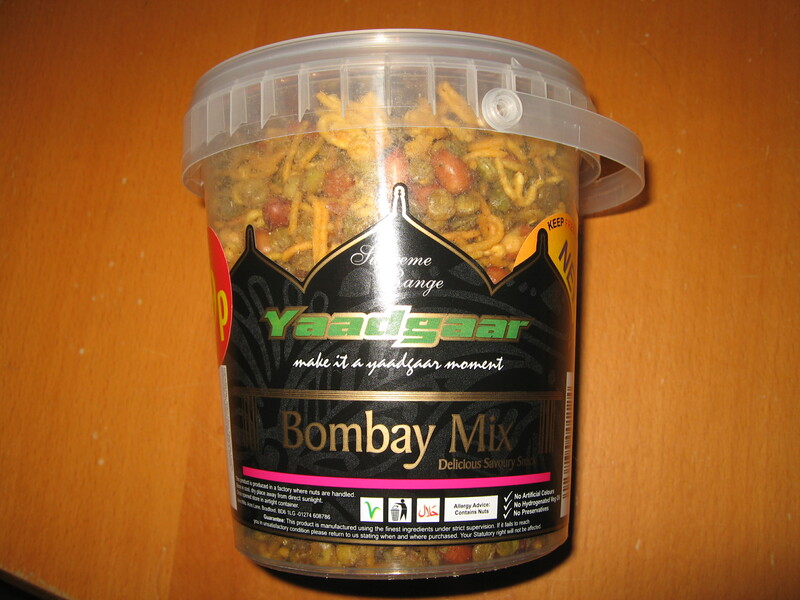 Bag Size: 380g (well actually tub size). Opinion: Quite ordinary in texture and taste albeit with a distinct lemon aftertaste, though there is no mention of lemon as an ingredient or flavouring. 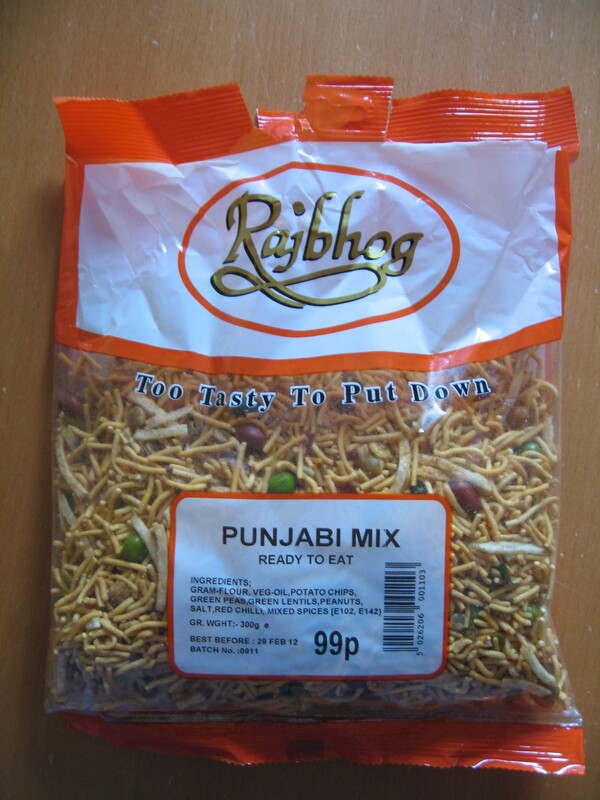 Might be unpleasant eating in larger quantities. 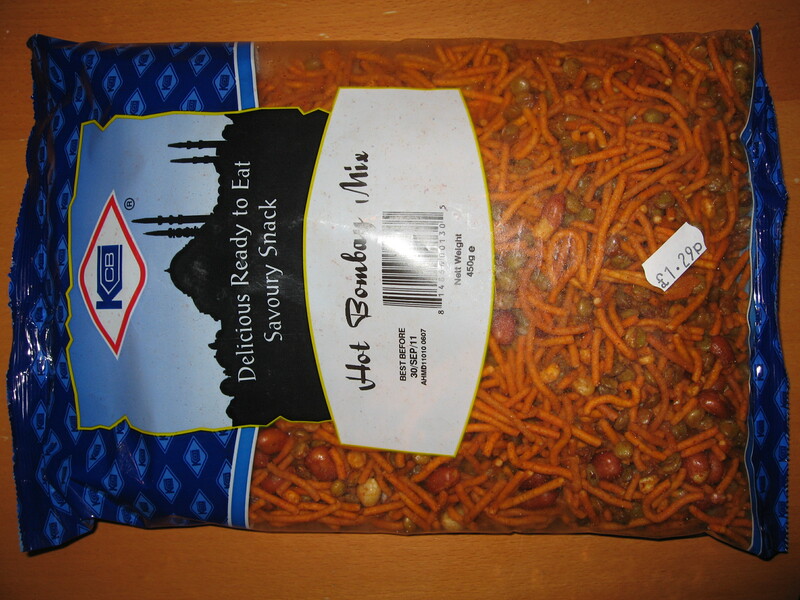 Look: Contains sultanas… but otherwise a standard mix with larger size noodles. 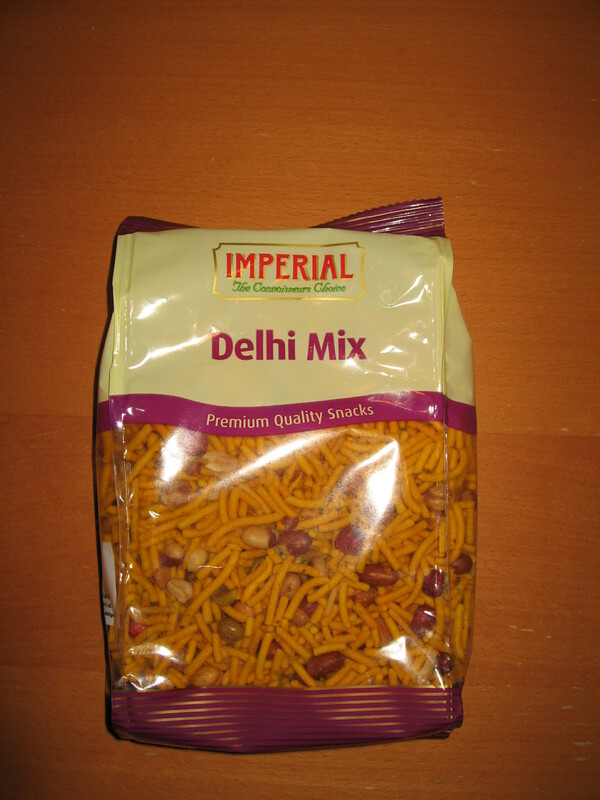 Opinion: Slightly drying, though the sultanas do actually add to the flavour by giving a sweetness. Nothing special. 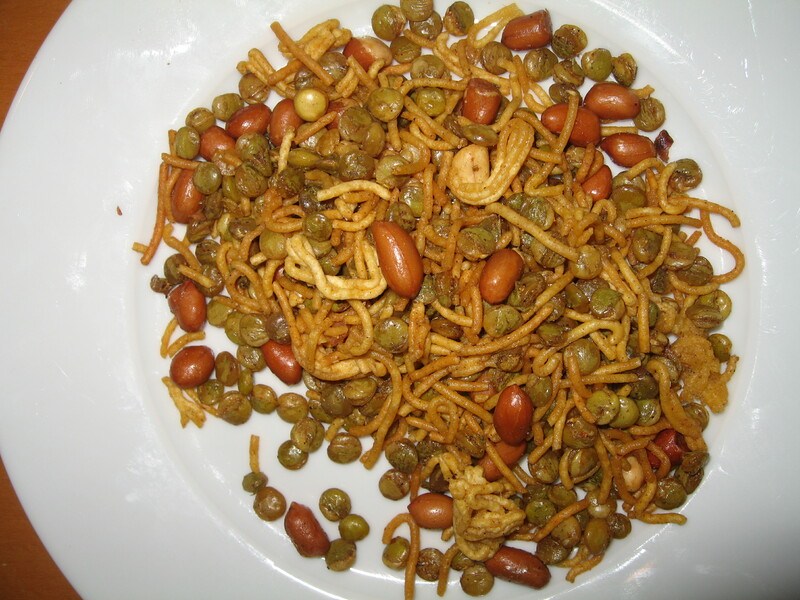 Look: Larger noodles, marrowfat peas, chick peas, peanuts, lentils. Opinion: Reasonably tasty, and the larger noodles don’t dry out your mouth. Expensive but edible. 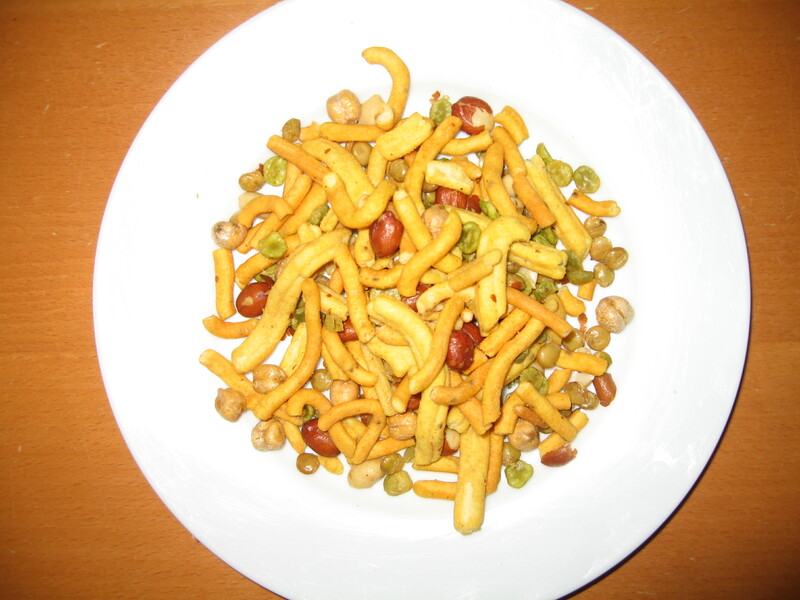 Look: Small noodles, peanuts, lentils, green peas, potato chipsticks. 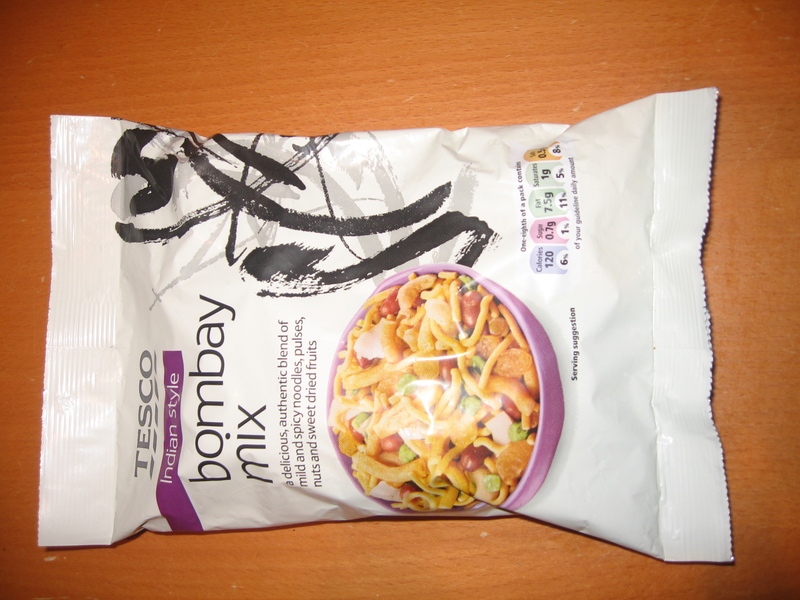 Opinion: It says “Too Tasty To Put Down” but it isn’t. It is actually quite dull. 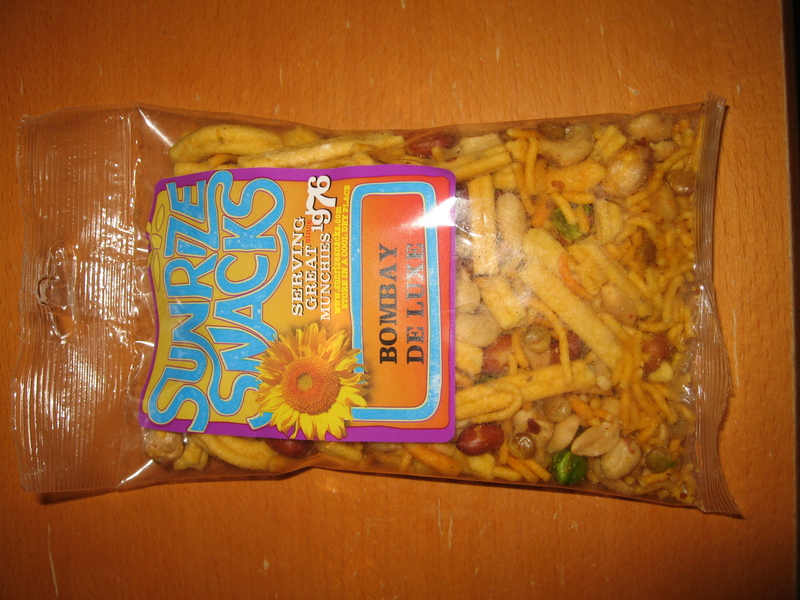 The chipsticks are interesting but don’t make up for the lack of peanuts. 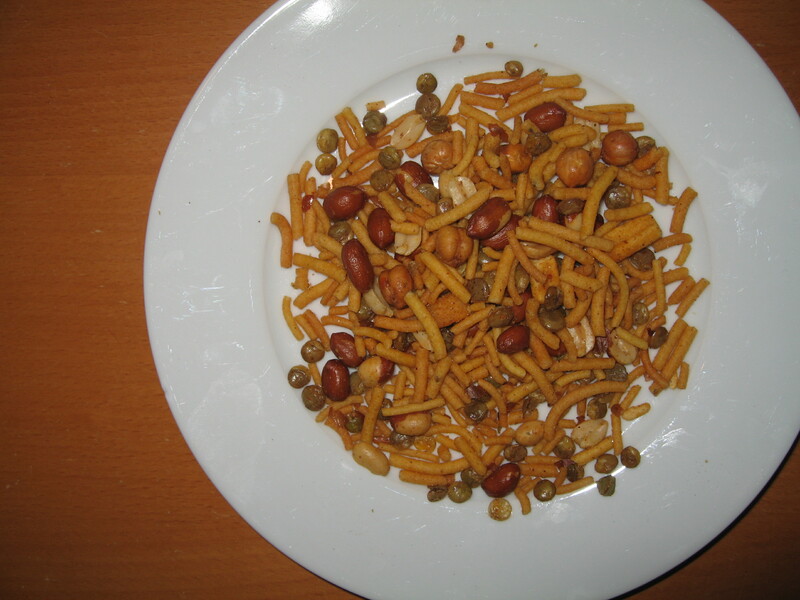 Look: Larger noodles, peanuts, lentils, chick peas, green peas. Opinion: Classic ingredients and a classic taste. Very good combination and got a definite thumbs up from my children. 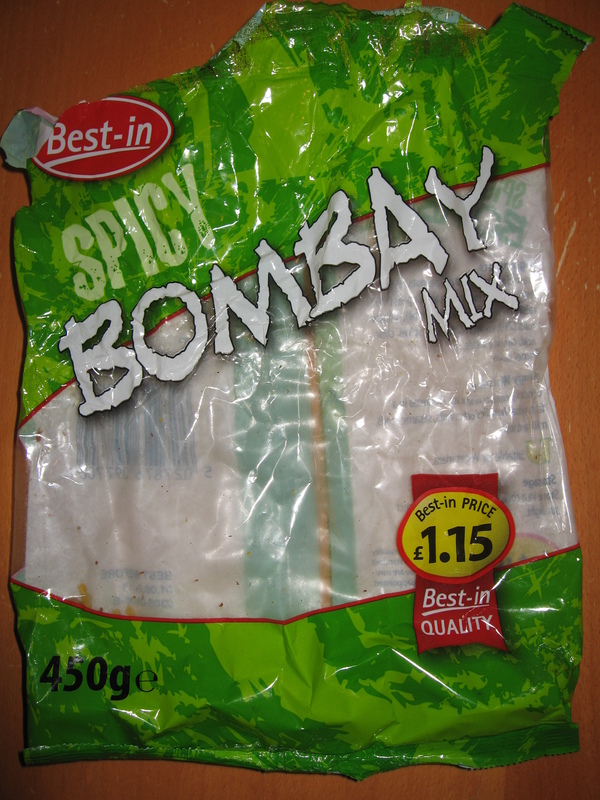 Last bag had slighty reddish tinge hinting at a dangerous level of chilli powder but that was not borne out in the taste. 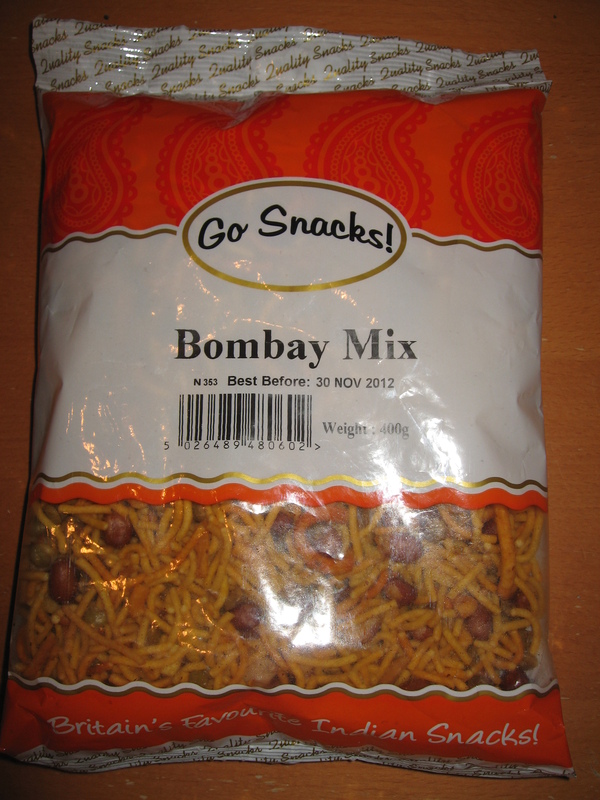 Whilst not as good as the Classic Bombay Mix from the same company, still very appealing. 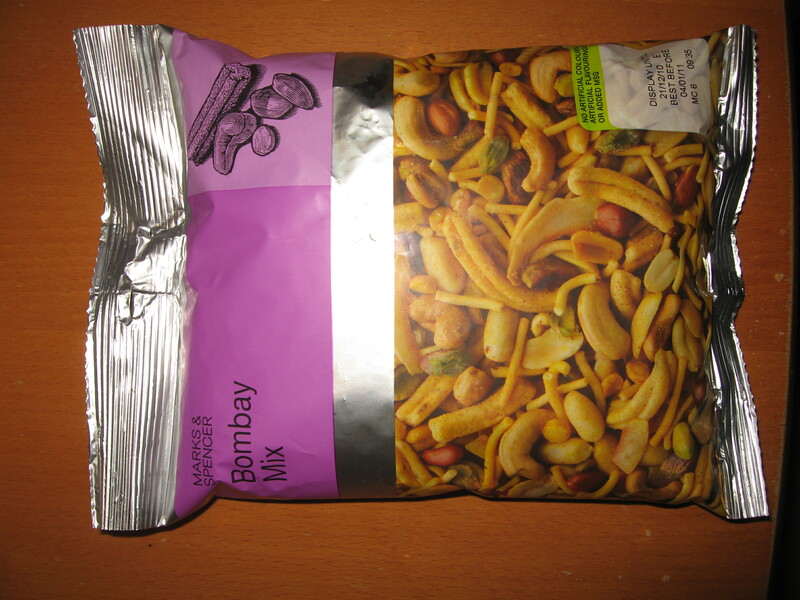 Opinion: A new pack design, now with more peanuts but a blander flavour, which is a shame. Seems to be quite lacking in any chilli spice punch which perhaps explains it’s relatively cheap (albeit special offer) price. 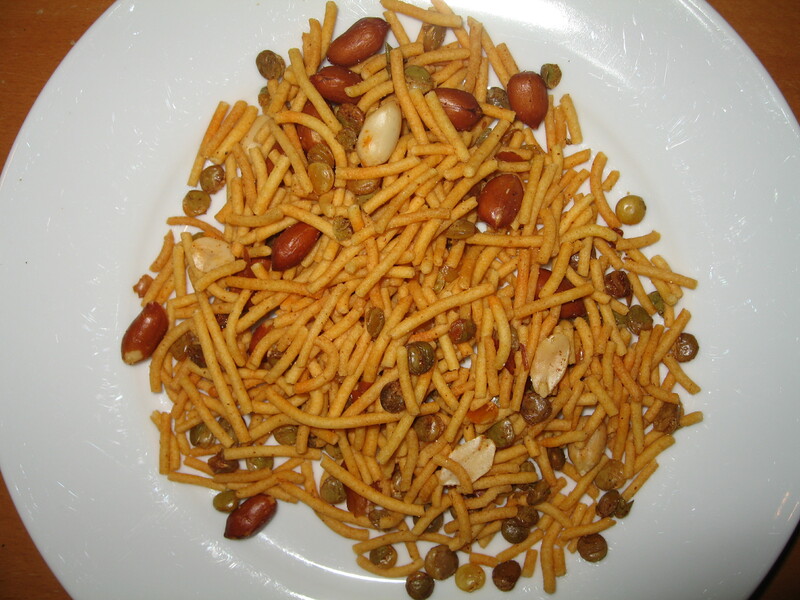 Look: Larger noodles, chick peas, peanuts, lentils. Opinion: Nothing special, pleasant enough but tending to blandness. 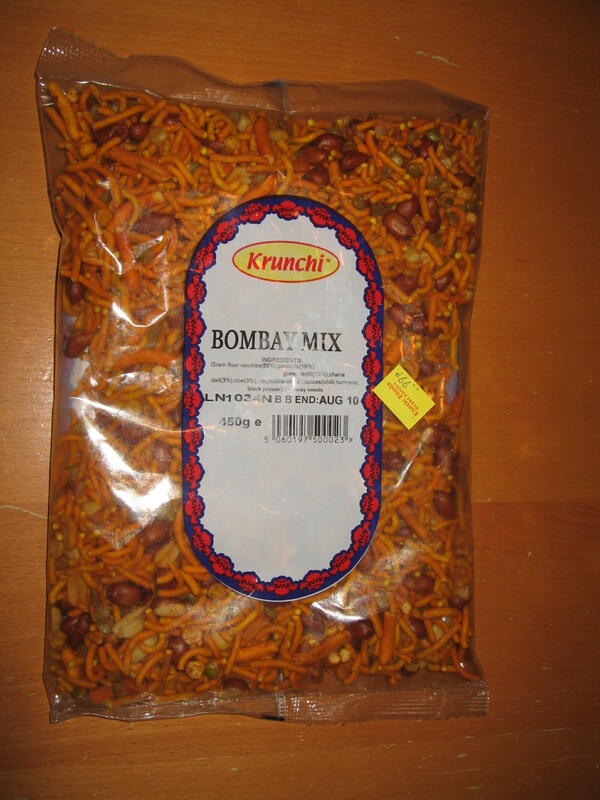 Excellent price makes this a good way to start children on the path to loving Bombay Mix. 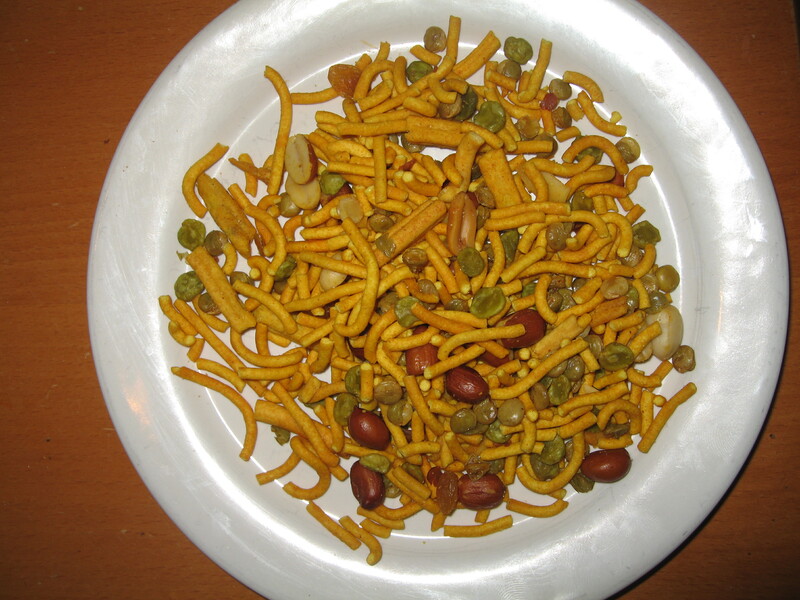 Look: Larger noodles, split peas, chick peas, peanuts, cashew nuts, lentils. Cisco 887 router LAN or Cisco switch port shown as down, down? Yet another ‘unusual’ Cisco IOS Ethernet port issue – you’d almost think I bring this on myself by having a complicated home network! I was configuring a Cisco 887VA-M on my home network and had finished so I plugged the FastEthernet0 port into my underdesk Cisco 2960X so it was part of the LAN. Change the cable. No difference. Try another port on the 887. No difference. Try another port on the 2960X. No difference. Reload, that will work. No difference. Speed, Duplex – I am clutching at straws now. Nothing seems amiss and nothing works regardless of what values I set. *Nov 9 15:25:05.915: %CDP-4-DUPLEX_MISMATCH: duplex mismatch discovered on FastEthernet0 (not half duplex), with Switch GigabitEthernet1/0/4 (half duplex). So my router can see across the Ethernet link to the other side. What is going on! Where is the other side gone now?! So it must be the other end causing the issue. Then I notice that the other end never had a link light. I never noticed because the 2960X is under the desk. Then it dawns on me. I set the ports on the 2960X to bpduguard to make sure that if I plug in a switch it doesn’t cause a spanning tree loop. That is why the port doesn’t come up on the Ethernet 877 router because the LAN ports are actually 4 switch ports. Doh! 000725: Nov 9 15:53:39.629: %SPANTREE-2-BLOCK_BPDUGUARD: Received BPDU on port Gi1/0/6 with BPDU Guard enabled. Disabling port. 000728: Nov 9 15:54:11.646: %SPANTREE-2-BLOCK_BPDUGUARD: Received BPDU on port Gi1/0/6 with BPDU Guard enabled. Disabling port. so that explains why the port on the router goes down every 30 seconds or so, I had autorecovery set on the 2960X, so it would bring the port back up, see the BPDU from the router LAN switch ports and disable the Ethernet port facing the router again. 3,2,1, fix the duplex issue, and we are back in action and I can get on and configure the ATM/Dialer1 interface. maybe it will be the other end that needs to be sorted. Cisco switch interface Up but Line Protocol Down? It is pretty unusual to find an Ethernet interface on a Cisco device which looks like it is working at Layer 1, so you get a Green link light on the Cisco device, but where it is not working at Layer 2 – so you can see no incoming Ethernet packets. Of course I had just such an instance yesterday when VOIP phones were not picking up an IP address from the DHCP server running on a Cisco switch. 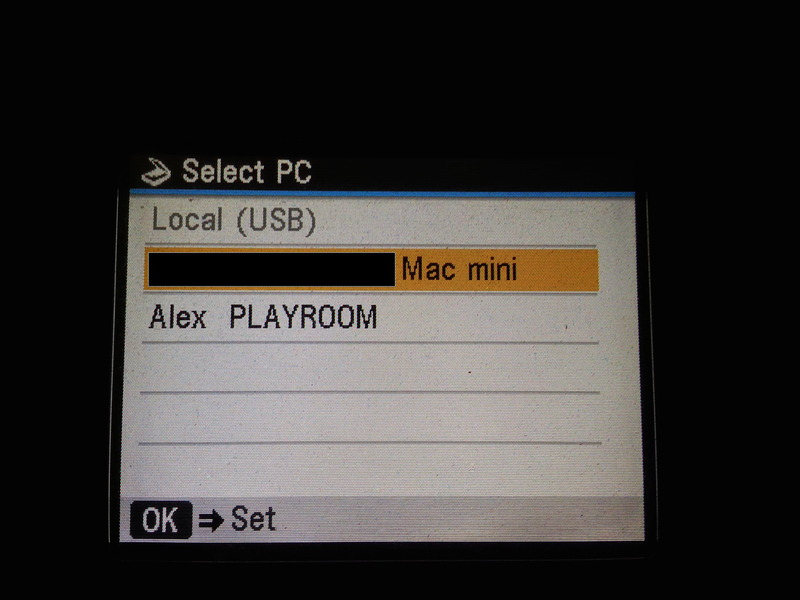 Other devices clearly where, including same make/model VOIP phones in other parts of the network. So this interface has Line Protocol down, why? I didn’t really focus on the word ‘monitoring’. Maybe it was a duplex or speed issue causing the non-passage of packets – but the negotiated value (Full-duplex, 100Mb/s) was right. Maybe it was the cable. I decided to do a TDR test, because this was a modern day IOS and I could! and immediately the line protocol came up. 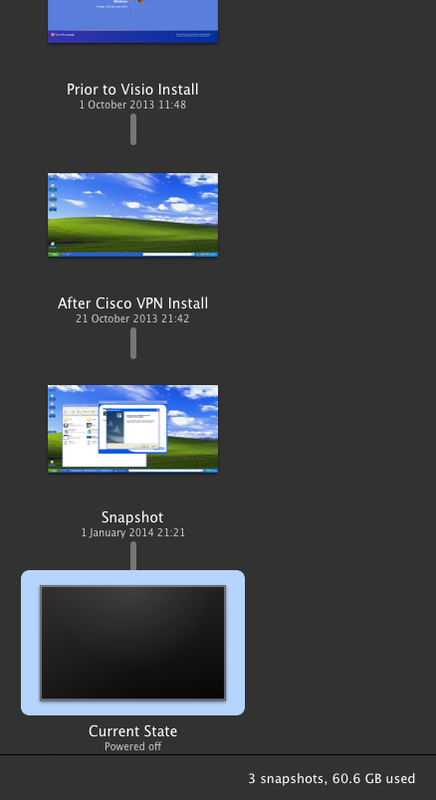 Lesson – always factory reset switches before you use them for some other purpose. This is a list of things that are inevitably true, written from the point of someone who has done network support for far too long. Your (IP/PING) packet may get there but that doesn’t mean it can get back. At a customer site you will either be standing around waiting or rushed off your feet. There is no middle ground. Requirements change often just before you hit return, and frequently after you have pressed return. Always get confirmation. Being blase bites backsides. If you don’t prepare, you will be caught out by something that otherwise would have been thought easy. Documentation and diagrams and descriptions are the lifeblood of support. Don’t set yourself up to bleed later by ignoring it. Early to rise and late to bed is what you should expect when going onsite. I decided I needed to replace an aging Konica Minolta Magicolour 2530DL and decided to also get more deskspace by getting rid of a Canon Pixma MX850 that I really only used for scanning/faxing. After looking round I decided to jump in with both feet with the Xerox WorkCentre 6605DN (it is just the duplex capable version of the 6605N). Probably overkill but I wanted something that did everything and would hopefully be reliable. even though the same document says that the WorkCentre 6605 is a Level 1 supported device (“Drivers for Mavericks are available and can be downloaded from Xerox.com.”)! So the problem isn’t caused by Xerox. But the problem it causes is mine, and presumably yours if you are reading this. With the Canon, you had a piece of software (the Canon IJ Network Selector) that spoke to the Pixma so you could select to scan directly from the scanner to your Mac or PC. With Xerox, you use the SMB protocol (amongst others) to do it and Apple altered their SMB protocol support so that even when you follow the (not very well described from a Mac user point of view) instructions in the manual it still won’t work. 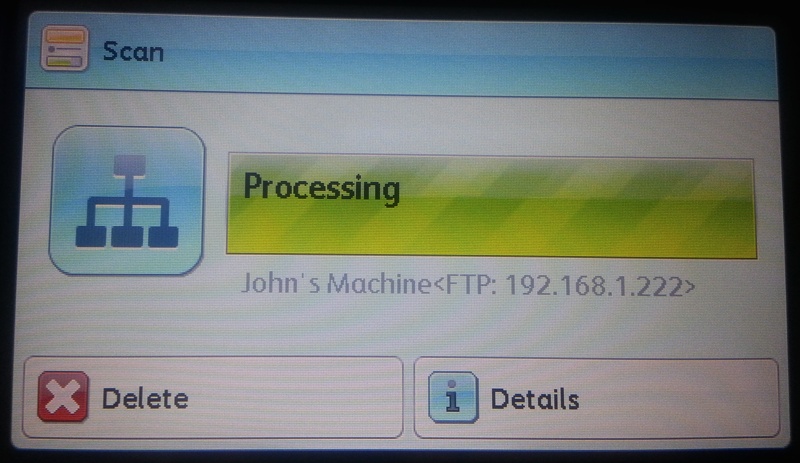 But you can get round it (and avoid sending it by email) by using the Xerox supported FTP protocol. Except that Apple removed the front end to this in Mountain Lion and Maverick! 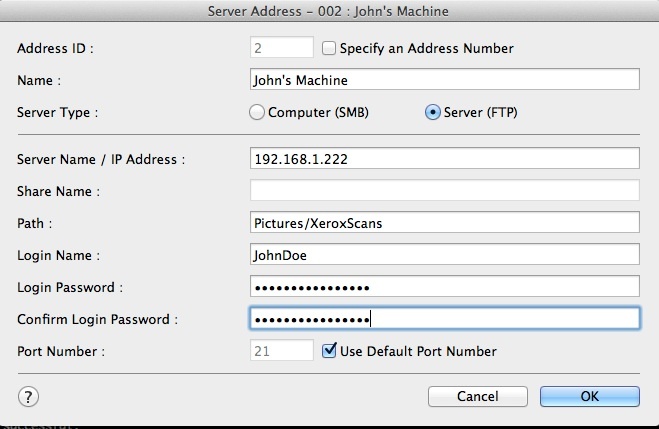 You can use an alternative FTP server with a GUI (some suggest ProFTPD) or you can just use Terminal to hand crank the FTP server. Or, as suggested here, you can have a small application that just gives you an alternative GUI front end to the existing OSX FTP service. This command (done from an administrator account on your machine) places the FTP service into the launchd service database and starts the service. Why would you want to stop the service? Well it uses a little bit of memory and perhaps more importantly, it is a service that lets someone with your username/password copy files to and from your machine remotely. You might be wary of that. Of course if you don’t want to have to type these commands then perhaps the GUI tool mentioned above might be better for you. 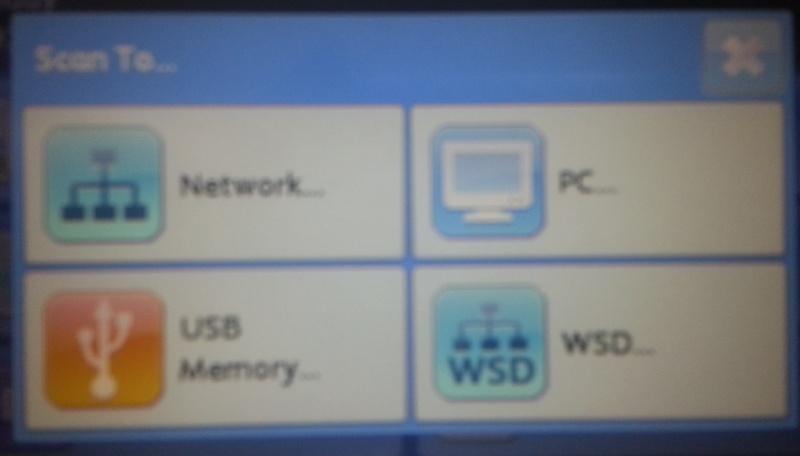 So now we need to configure the scanner part of the WorkCentre 6605DN. We can do this using one of the utilities installed with the Xerox OSX software. 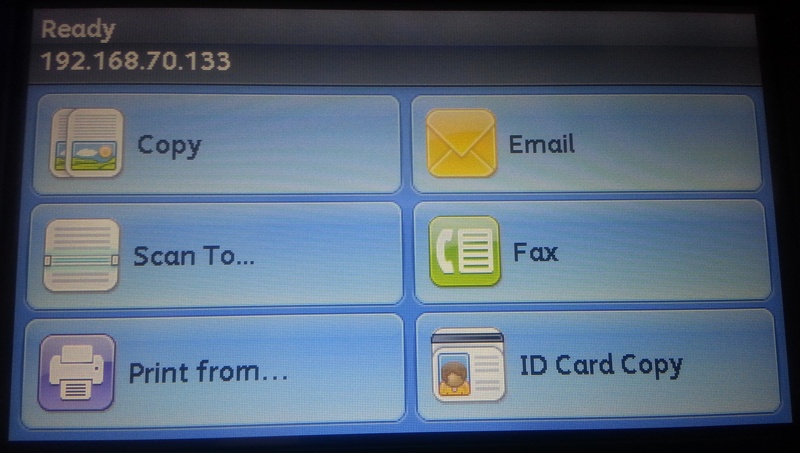 Inside Applications/Xerox is the Address Book Editor. This lets you edit the destinations the scanner knows about, without having to use the keypad on the scanner to enter all the details. Start the application. 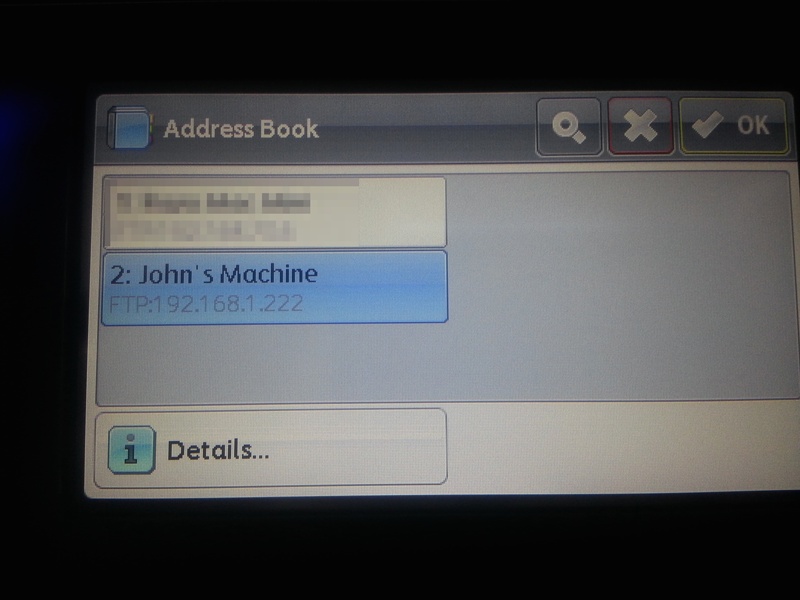 Click OK and you can now see your entry in the main Address Book window. 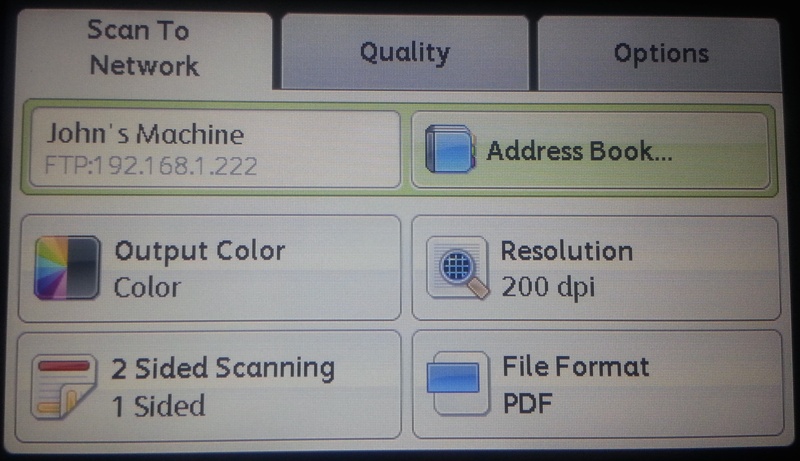 Now we can actually do a scan from the Xerox 6605. Here is the front panel touchscreen display. We will select the one labelled ‘Network’ in the top left corner. It then shows you the ‘Server’ entries from the address book. Select one (it turns blue), and then we are going to click the ‘OK tick’ in the top right part of the screen. Assuming all is okay, press the big green start button next to the keypad on the operators panel of the machine. 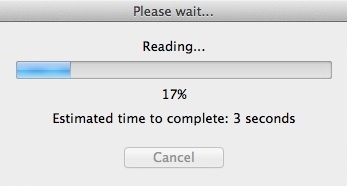 … and it failed. 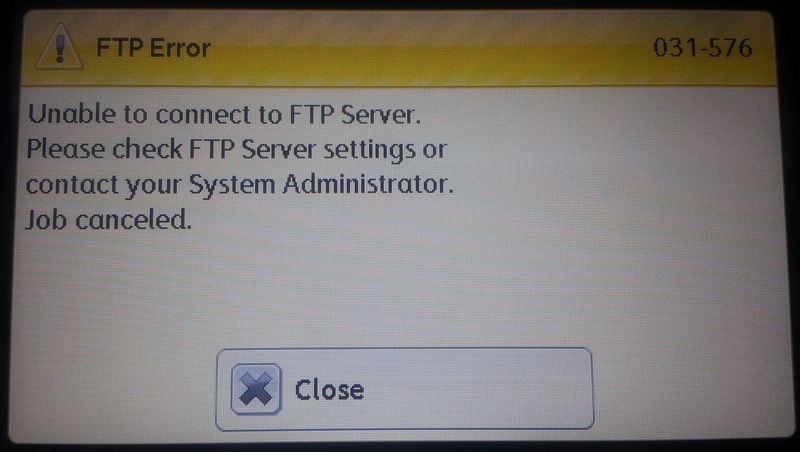 I did this deliberately so you would see what the error message looked like. 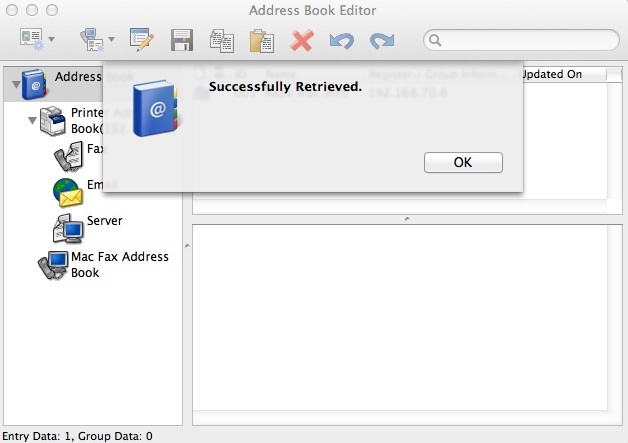 It will fail if the address is incorrect, or you selected a non-default port (it is normally 21 – scroll up the the entry we made in the Address Book editor and you can see the default listed) and the FTP server is not running on that port, or if the machine is off or not running an FTP server at all, or the username and/or password is incorrect or the path to save the files is wrong (remember what I said about not using a space in the filename). 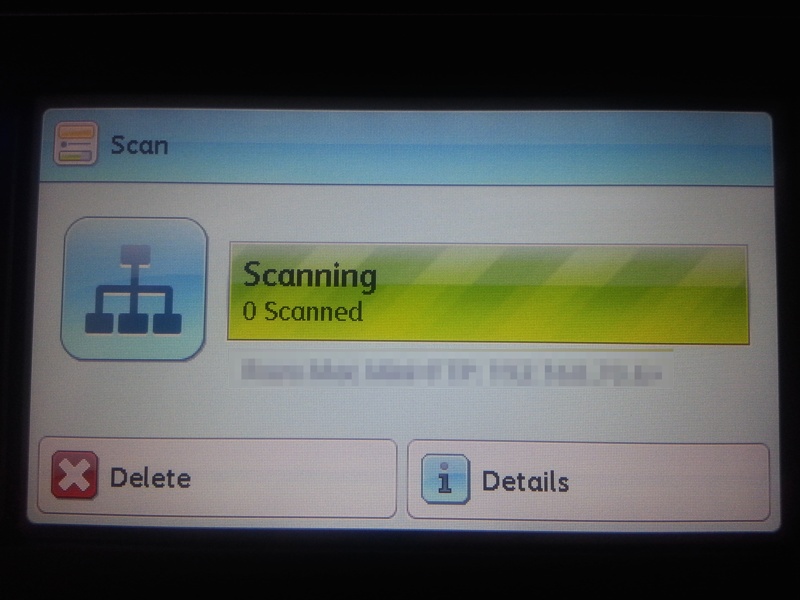 Now if only it would scan multiple photos and save them in separate files in one step, like the Canon Pixma does. 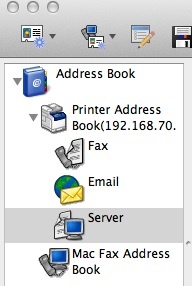 As a side note, if you decide to set up the mail option, you need to reboot the printer before it will connect properly to the mail server (or at least that is what I found out, eventually, when using Gmail). 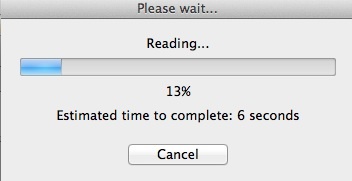 Not the best sight to greet you when you try and start up a VMWare session on Fusion (VMWare’s OSX implementation). I knew that I had caused this by Force Quitting Fusion the night before because I thought it had hung. In fact it was moving disk blocks around because I had deleted a snapshot. I could see no ‘reclaimable’ shading on the bar so it seemed that the old snapshot had been cleaned up correctly. But the session would not start. I needed to find the log file to see what was going on. 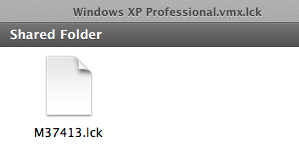 Inside this folder was one file – the container holding the operating system I am using on the machine under Fusion. 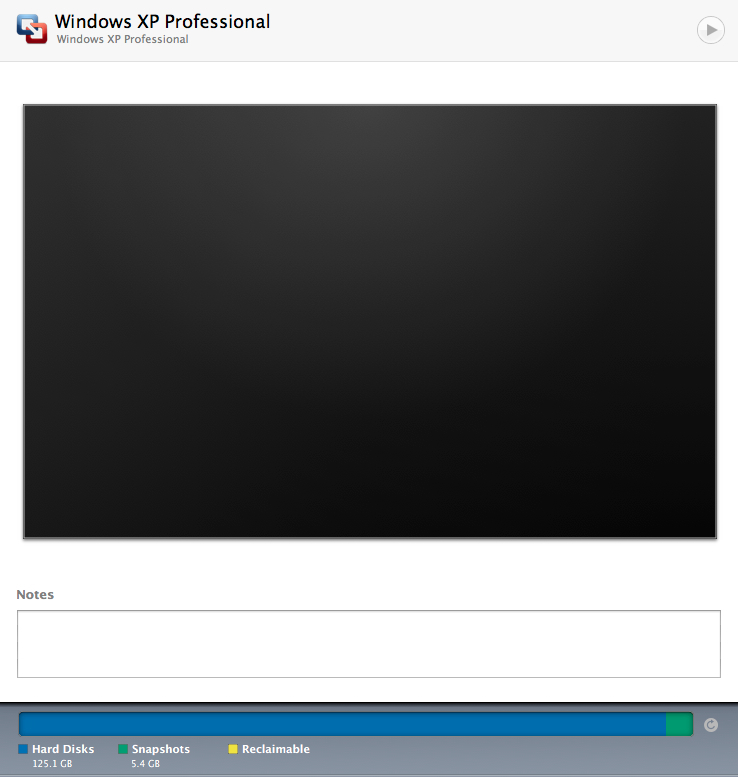 2014-06-18T19:13:20.759Z| Worker#0| I120: DISKLIB-SPARSECHK: [/Users/raza/Documents/Virtual Machines.localized/Windows XP Professional.vmwarevm/Windows XP Professional-000002.vmdk] Grain #565030 @72349568 is orphaned. followed by more “Grain #nnnnnn is orphaned” messages for the the vast majority of the 106MB log file. It was at this point I realised that I had older snapshots, and I had a backup of the data inside the current container because I use a backup agent when the container is working. What I didn’t have was a backup of the container (or rather of the physical file). I hadn’t done this because of course the file is huge and when you are in Fusion, the file is open so you can’t get a consistent backup anyway. So I did what any sensible person does at this point. I googled. It looked like it might just be a lock file issue (it wasn’t, and that was the solution because I did have to go to an older snapshot in the end) so I thought I would visually document the answer if it had been a lock file problem – which has the same symptoms. In the folder, the 02 suffix file was the snapshot that had the issue – 75GB of changes… ouch! 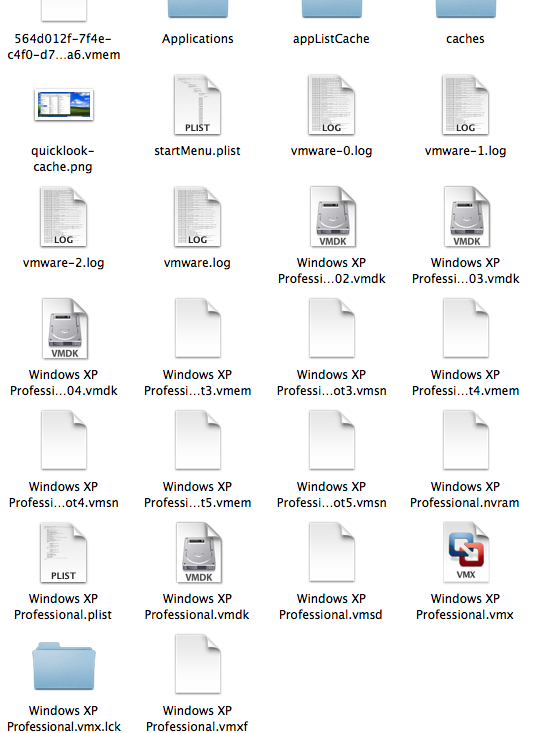 The file extensions are explained very well at http://on-cloud9.com/2012/01/16/virtual_machine_files_explained/ and https://www.vmware.com/support/ws55/doc/ws_learning_files_in_a_vm.html so I don’t intend to repeat it here. So I deleted the folder. Now the Library window shows that the snapshots are accessible. Sure enough, you can see them. But annoyingly if you try and start the Current State file, it still fails with the same error. 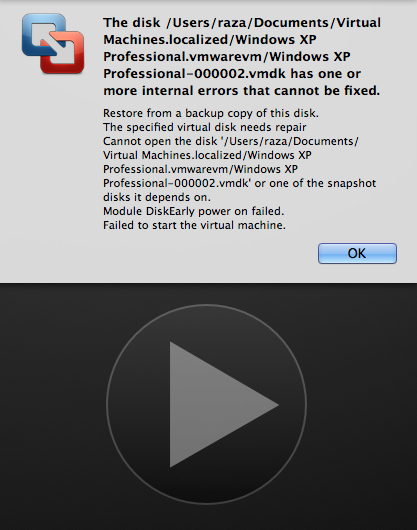 The virtual disk, ‘/Users/raza/Documents/Virtual Machines.localized/Windows XP Professional.vmwarevm/Windows XP Professional-000002.vmdk’, is corrupted and cannot be repaired. There was no choice but to go back to the last snapshot and then apply all the changes I had made. Luckily there were not many, and those that could have been tricky – like applications, turned out to be okay because I had retained copies of them on a network volume (I had deleted them from the physical PC that was being migrated to a VM as I completed each transfer). Once that was done I reinstalled the backup software and pulled any local user files from the last backup. c) that snapshots are not equal to backups because they are on the same physical host and even if you were to copy them elsewhere, they are a chain of files holding changes from the last snapshot. 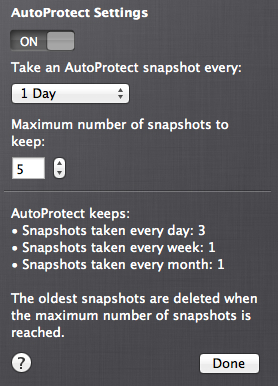 That means if you lose one, you risk not being able to use later snapshots. The article https://communities.vmware.com/thread/177906 and https://communities.vmware.com/message/2118363 suggests I might be able to open the corrupt vmdk using VDK or UFS Explorer under a windows 32bit platform… I’ll update this post if I ever try that. Wow! I tried UFS Explorer (on OSX) against the damaged vmdk file. It had absolutely no problem reading it and let me do a recovery of files without a problem. I didn’t need anything from the container but at least I was able to verify that I had not missed anything in recreating it from an old snapshot + backups. and picked on the ‘Do Not Use’ option. Bad idea because the listed scanner MAC address immediately disappeared. No problem I thought, I’ll just rescan. There isn’t a rescan option. 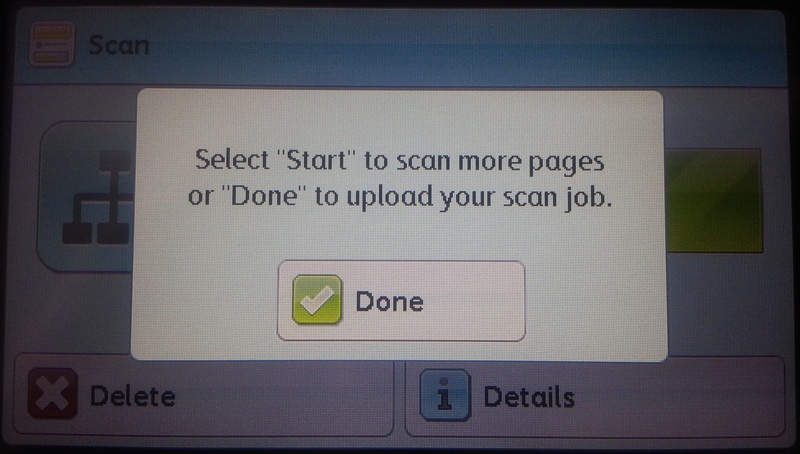 In fact there was no way I could find to get the scanner listed again. In the end, the only way to recover the situation was to reinstall the Canon MX850 Scanner Driver software from the Canon support site. I had an irritating problem with my preferred OSX mail client, the venerable Mulberry, whereby it would not open the INBOX on my tuffmail.com hosted account but it would open the INBOXs for other mail accounts. It was also quite happy to permit access to other mailboxes in the Tuffmail account. I could get to that INBOX from other IMAP clients running on Android (K9 Mail) and Tuffmail’s own HTTP clients. 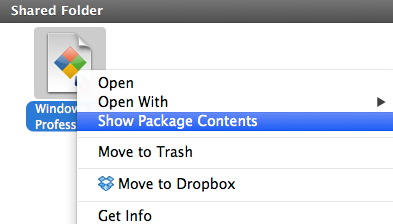 It could also be accessed via the OSX Mail App (after a very, very long wait for synchronisation…). 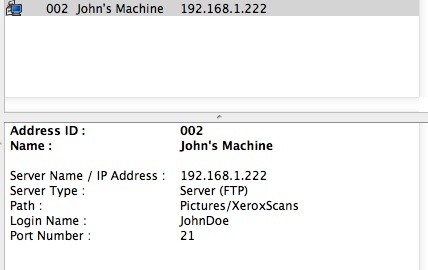 Protocol logging showed the IMAP login and facilities of the mail server, then a SEARCH UNSEEN, then nothing. I thought there was possibly a INBOX size limit at the provider (though it was nowhere near as big as it has been in the past, and other mail clients worked) or that some bad email was causing Mulberry to bomb the account (but protocol logging showed nothing). Then I realised that I had installed AVAST on my Mac and that has a Mail Shield component that sits in line with the IMAP connection. I realised this when I saw the certificate pop up in Mulberry from AVAST after restarting the mail client. Avast Mail Shield gets in the way but only when you restart the Mulberry application. If you didn’t close Mulberry and restart it after the AVAST installation, it might be some days/weeks before you notice any issue. This happens regardless of whether you have SSL on or off to your mail account. It happens regardless of whether you set Avast Mail Shield to scan secured connections except that if you set SSL/IMAPS access to your account and you switch off Avast Mail Shield secured scanning, you can get access. 1) Don’t run AVAST, but that isn’t very palatable. There are lots of infected attachments and although they might not target OSX, that is going to happen. 2) Use SSL to access your mail account and switch off Scan Secured Connections, but then your other SSL secured accounts are not scanned. 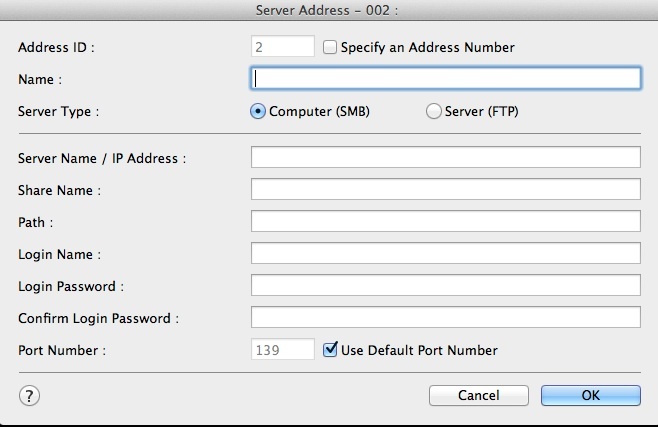 3) Use the Ignore Mail Server option to exclude only the failing mail account and then decide whether you want to do SSL or not to that and the other mail servers. Obviously having SSL on means that your mail is encrypted in transit between the mail server and the mail client, so it is a sensible option to have switched on. By the way, switching to OSX Mail App with AVAST did show up at least 90+ emails sitting in mailboxes with infected attachments, so even though they were Windows specific issues, at least I got something for my pain. It also shows that you shouldn’t just rely on your ISPs to spot every rogue email.